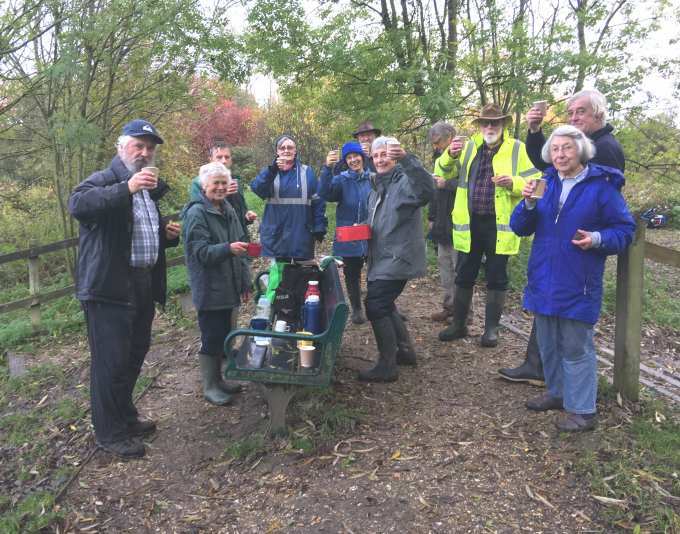 The last workday of 2016 was warm and damp, and 17 volunteers turned up at HQ eager to see out the old year in grand style. We were glad to welcome a new recruit, Tony Kellaway. Four first aiders were identified, and safety advice given. 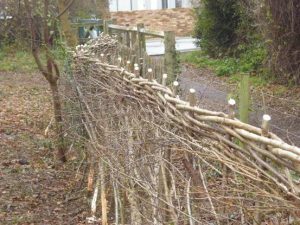 Jennifer outlined the main task for the day, which was to use up all the cuttings from the recent hedge laying along Seagull Lane; they had to be trimmed to a manageable size, and could then be re-used to fortify the reptile refuges in the north Meadow. 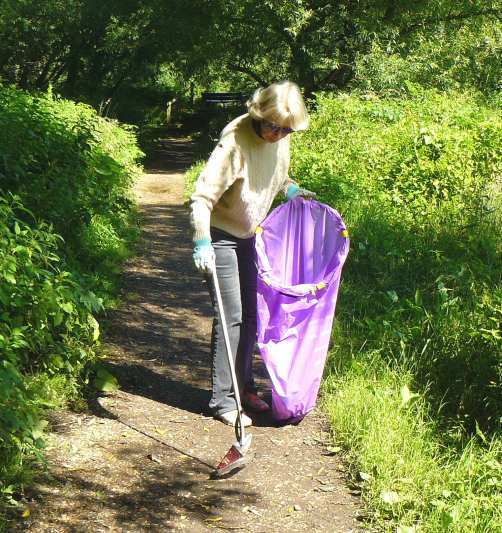 Other tasks were a thorough litter pick of the whole site, including the northern part of the river, and a wash and brush up of all the sign cases. 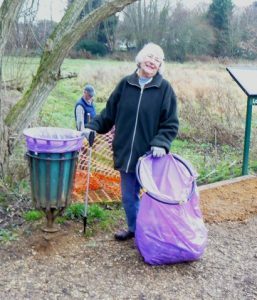 Suzanne and Jane did the litter picking. 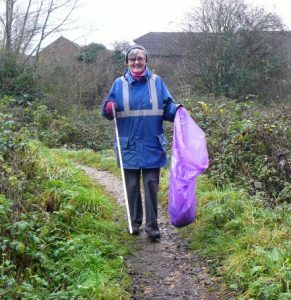 and Debbie spent her time clearing debris from the river with impressive success. With so many workers available, it was possible to detach three to finish off the remaking of the steps from the north bridge to the meadow, which had been postponed for a while. Phil led that work force, and with help from the two Davids, and with customary skill, they succeeded in making the new steps available for a congratulatory photo by the end of the morning. Meanwhile, the rest fell to with saws and loppers, and reduced the piles of cuttings into useful lengths, and carried or barrowed them away to be placed on the 5 hibernacula along the raised causeway path in the north meadow, rendering them more secure, and we hope warmer for the Slow-worms which have bred so well this summer. 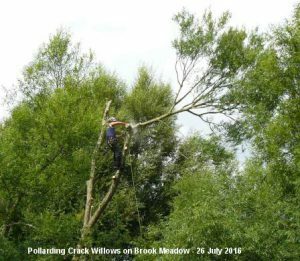 Tony and Mike were then persuaded to start on cutting the branches of the fallen willow in the north Meadow in a similar manner, and these were used to reinforce the habitat pile in the far north eastern corner which was originally created more than two years ago. The smaller bits of off cuts, and the wickedly thorny rose and blackthorn cuttings were burned on a well-managed bonfire. Here is link to a short video on YouTube of the volunteers enjoying the bonfire. By 11.30, Maurice opened up the boot of his car and produced what (I suspect) we had all turned up for: mulled wine, stollen and mince pies. A festive atmosphere soon developed, and we resolved to repeat this sort of celebration, maybe in the summer with Pimms and cucumber sandwiches! Dan presented us all with Austrian gingerbreads to take home with us. Grateful thanks to both for their splendid generosity. All the tools were cleaned and returned to HQ including these. We all wished each other a ‘Merry Christmas, and we look forward to meeting again on the third Thursday in January, the 19th, as there will be no workday on Sunday January 1st 2017. A blessed and peaceful Christmas to all our loyal members and supporters. 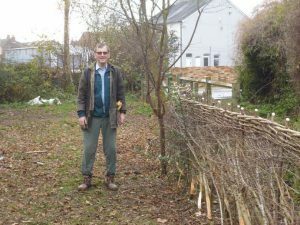 Following earlier discussions, and the successful laying of a planted Hawthorn hedge in the North Meadow in December 2011, it was agreed that Mike Probert would lead the laying of a further section of hedge – from the Seagull Lane gate to a mature Hawthorn ‘standard’ (c. 20m) – this time in the ‘South of England’ style. 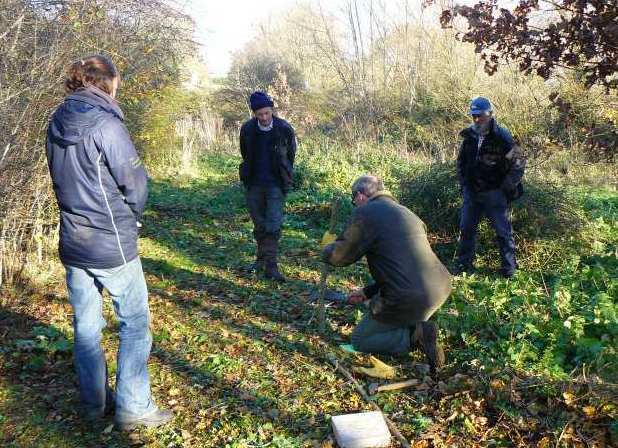 The first few metres comprised a row of tall multi-stemmed Dogwood with three close-planted semi-mature Field Maple behind and several small Hazel behind them. 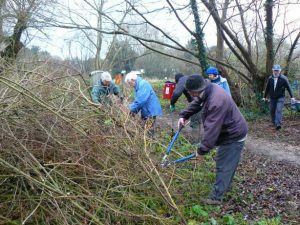 The remainder was a true mixed (Hawthorn, Blackthorn, Hazel and Rose) hedge planted in 2010.Here is a photo of a group of volunteers planting the hedgerow. The section of hedge at the far end of the run was planted for the Queen’s Diamond Jubilee in 2012, but is currently too young/small to lay. 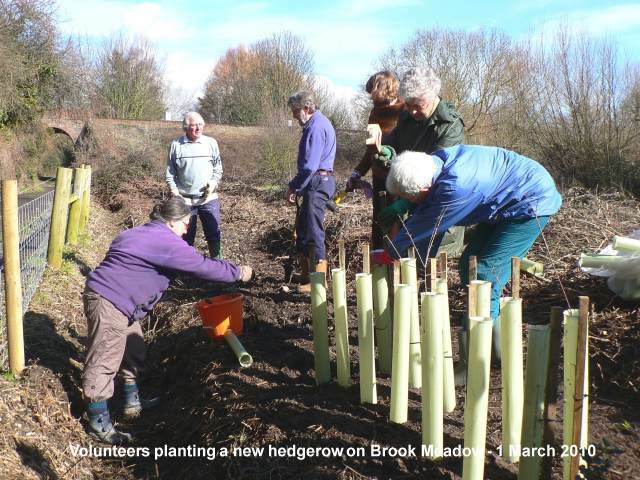 Here are volunteers planting the new hedgerow in March 2012. 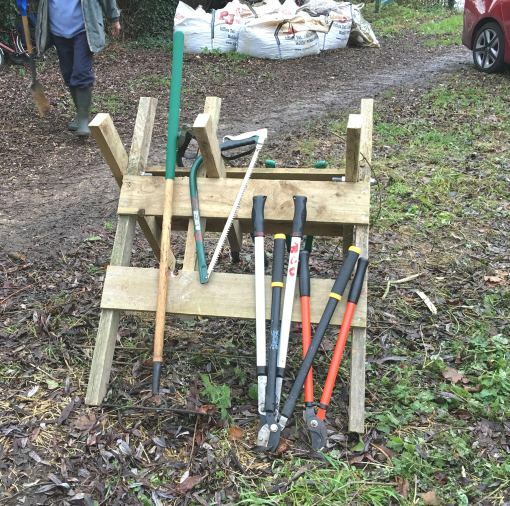 Mike had sourced the Hazel stakes and binders required for the hedge laying from West Dean Woods (Sussex Wildlife Trust) and he and Maurice collected them on 28th November. Work commenced on 29th November in lovely sunny, cold weather which continued throughout. 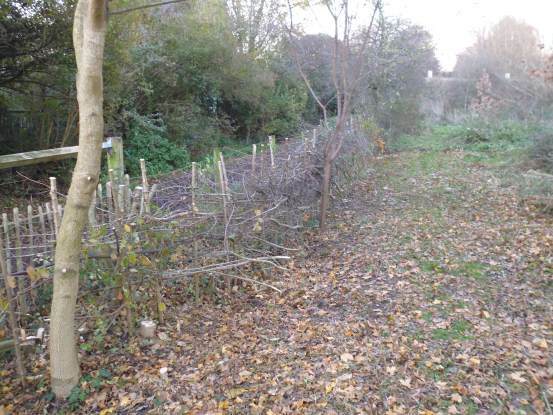 The first job was to clear out and coppice the extensive Rose growth from amongst the mixed hedge, thin the Dogwood stems, fell the outer two Field Maples (to enable the ‘balanced’ central one to grow evenly into a mature standard) and coppice the Hazel behind. The group comprised Mike, Maurice, Tony, Colin and Jennifer. Rachel from TCV joined us for the morning. It was hard work but by early afternoon the initial clearance and felling was complete and the laying of the first few stems of the planted hedge commenced. On the second day Mike and Tony laid the Dogwood stems by the gate and connected that run diagonally with the first few stems of the true hedge – a tricky job! Dan tidied the site in the morning and Colin helped in the afternoon. 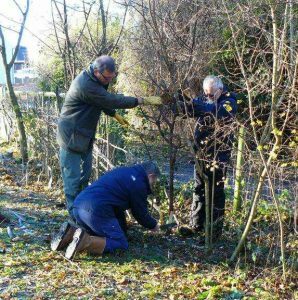 On the third day, Mike was joined by Jennifer (who brought welcome refreshments), Maurice, Colin and Phil who continued to lay the true hedge almost to the Hawthorn standard, leaving a larger Blackthorn to grow as a standard and also a small Holly to grow free. Photo of the hedge after the third day. 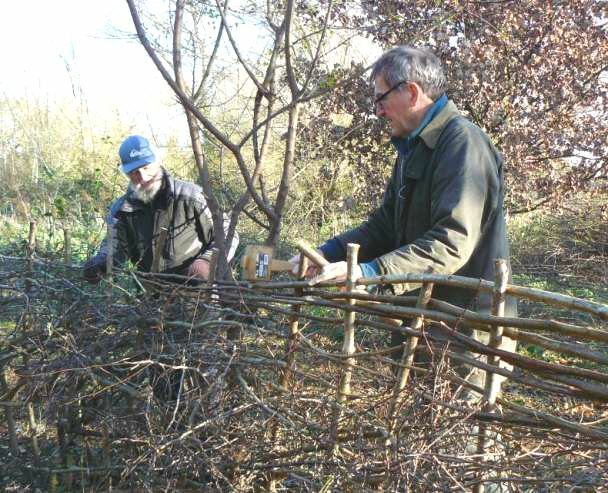 On the morning of the next Brook Meadow general volunteer tasks on 4th December, Mike and Tony finished the laying of the hedge, tidied up the lay and the stakes and commenced the binding along the top of the stakes to make a very tight and robust structure. Finally, on the morning of 7th December Mike and Phil completed the binding, adjusted the height and cut the top of the stakes to ‘mirror’ the cut faces of the laid stems (pleachers) below – a ‘good job done’ over three whole and two half days! 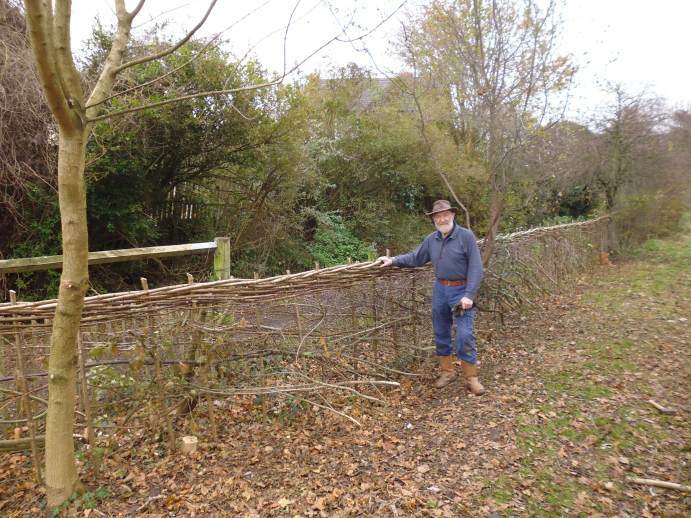 Phil standing by the completed hedge. Brilliant job! It should be noted that in order to complete the job, a few stakes and binders were cut from one of Brook Meadow’s own small Hazel coppice. It was another beautiful cold, sunny morning and nine volunteers arrived to carry out one of two tasks. The Leader, Maurice, explained the tasks, the tools to be used and the risks involved. First aiders were identified and volunteers were selected for the jobs. 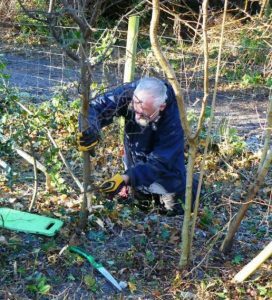 The first job was to assist Mike in the last stages of hedge laying to part of the hedge along the west side of the Seagull Lane patch. 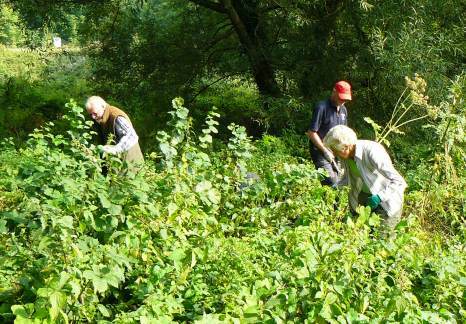 During the preceding week, several volunteers had helped to lay this section of mixed species hedging. Tony assisted Mike in this. 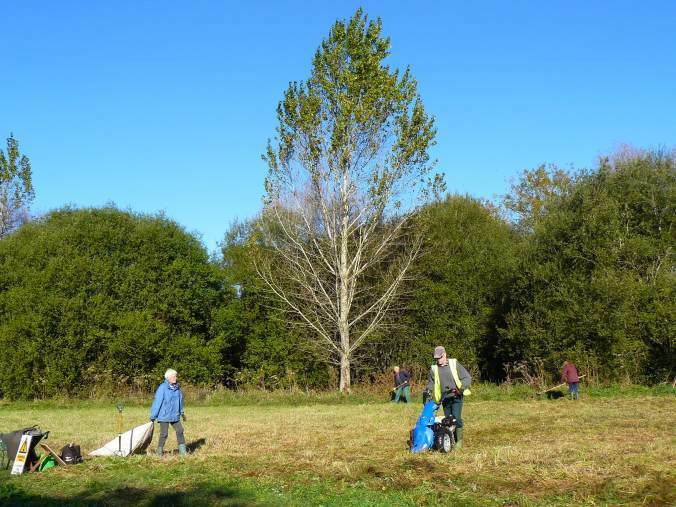 The other task was to complete the clearing of the northernmost section of South Meadow. 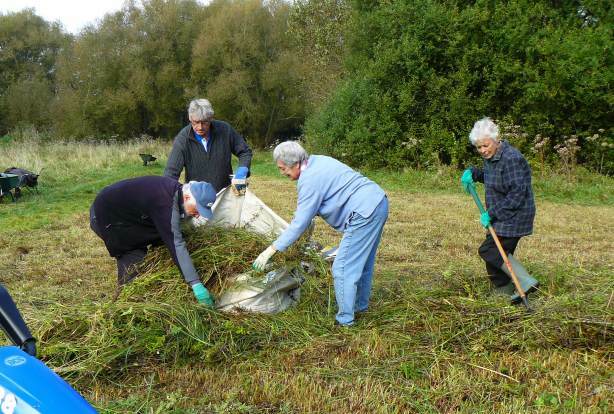 Wally, Jennifer, Pam, Nigel, Debbie, Anne and Pam, went to the South Meadow armed with rakes and shears. Here there were two jobs, one to rake the remains of the arisings from the previous work day. The reason for this was to remove nutrients that would otherwise discourage the growth of some preferred vegetation. 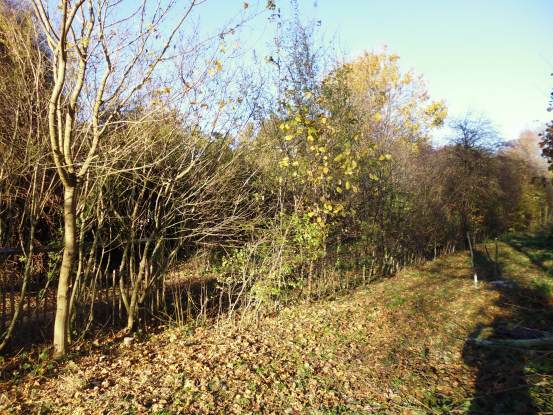 The second job was to cut the rest of the thick vegetation growing along the north side and around the Alder Buckthorn grove. This was started using shears and rakes. During this process, it was decided to use the power scythe for some of this work. 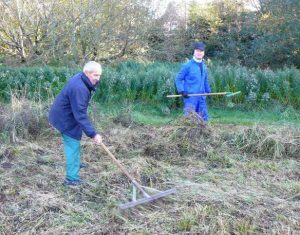 Maurice collected the scythe, then he and Nigel cut the vegetation to enable the other volunteers to rake up and dispose of it on an adjacent waste pile. 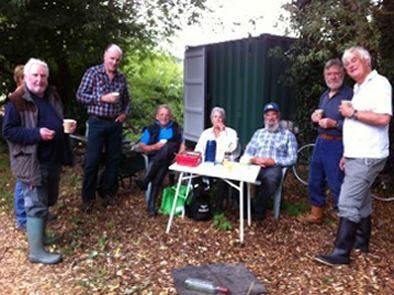 At 11.00 the volunteers welcomed the chance to put down their tools and enjoy a well-earned break. Pam, as always provided refreshments. After this we returned to the jobs in hand. Finally the clearance of vegetation around the Alder Buckthorns was complete. At mid-day, the tools were cleaned and returned to HQ. Everyone was most impressed with the completed section of the laid hedge near HQ. Special appreciation is due to Mike helped by Tony. Well done everyone, a great morning’s effort. The next scheduled workday is Thursday, 15 December. Meet at HQ, located between the north bridge and the Seagull Lane gate, at 09.50, for a prompt start at 10.00. All volunteers, both regular and anyone else, will be warmly welcomed. Trained First Aiders will be on hand. Festive refreshments will be provided. All necessary tools are provided and, where necessary training will be given. 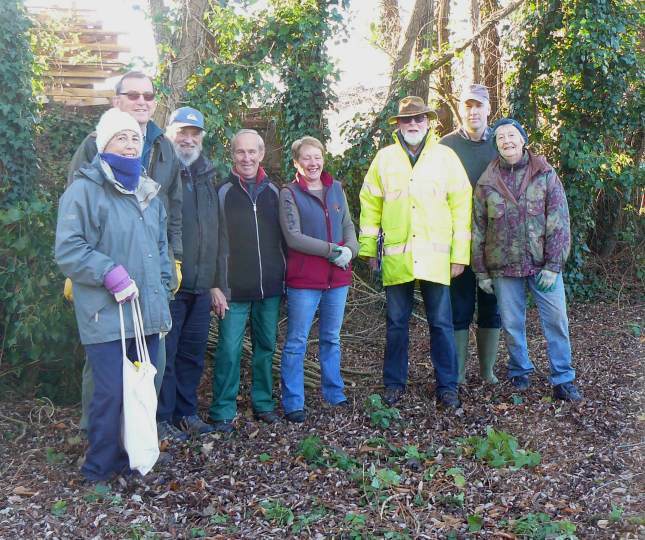 It was a cold and frosty morning with bright sunshine for the start of the special hedge laying work session on the Seagull Lane patch led by Mike Probert (centre). 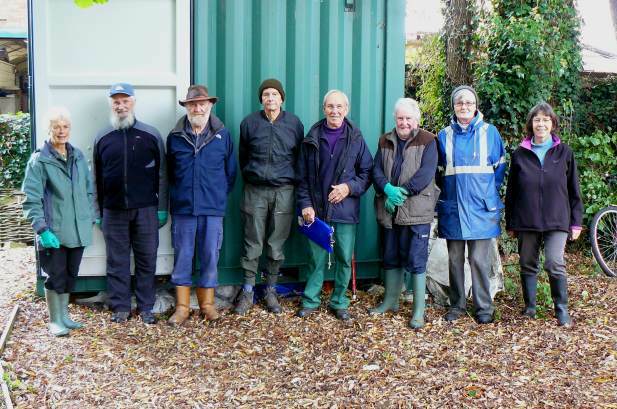 Other volunteers from left to right were Colin, Maurice, Tony and Rachel from TCV. The first job was to cut out the rose bushes from the Jubilee hedge as they would hinder the hedge laying. Two Field Maple saplings were also cut down leaving one to grow as a standard. 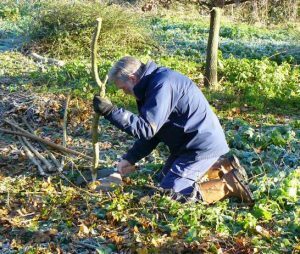 Once the hedge had been cleared, Mike demonstrated the art of hedge laying which would be carried out after lunch and continued on Thursday. 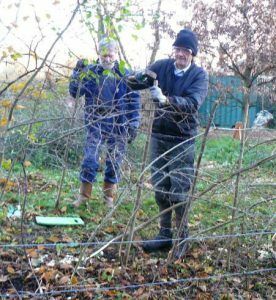 Mike was also instrumental in laying the Hawthorn hedgerow on the west side of the main meadow several years ago which is now well and strong. The hedgerow to be layed was originally planted with a mixture of native shrubs in March 2012 to mark the Queen’s Diamond Jubilee and has grown magnificently. Here is a reminder of the planting day. The three Oak saplings were planted on the same occasion. 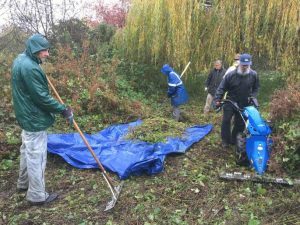 Despite threatening rain, thirteen volunteers appeared at the usual time for a couple of hour’s hard work. 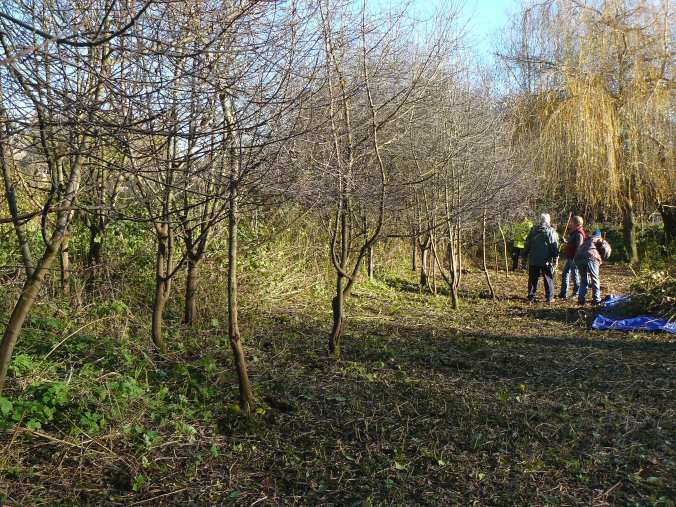 The main task was to clear the overgrown north section of the southern meadow from behind the Alder Buckthorn plantation to the first diagonal path. Maurice, leader for the morning explained the nature of the task and the hazards to beware of both environmental and in the use of tools. Two trained first-aiders were present. Brian recorded the gathering of volunteers, smiling despite the moist atmosphere. 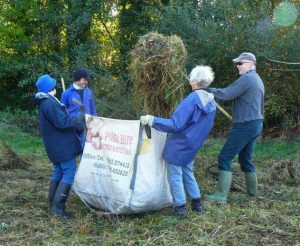 The new power scythe came into its own, cutting through three year’s heavy growth of tangled bramble, bind weed straggly nettle and the magnificent tall remains of wild angelica. 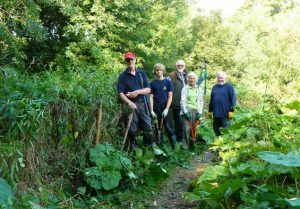 Maurice, Tony and Phil took turns cutting, ahead of the gang of rake, pitch and fork wielding volunteers, gathering the cut vegetation. The collected material was carried to a new dumping point on the west side of the south gravel path, away from the usual route of overflowing river water in a flood situation. The old dumping point in the northeast corner is no longer viable as the Environment Agency needed to clear it when carrying out the reinforcement of the Gooseberry Cottage flood bank. 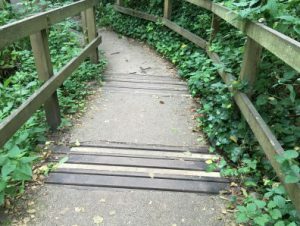 Earlier, Phil completed the removal of the rotten timbers and steel spikes in the old flight of steps near the north bridge prior to the completion of its rejuvenation. This work will be done at a future time. At 11.00 the weary volunteers welcomed a chance to lay down their tools as it was time for a well-earned break. Pam, as always, the supplier of refreshments poured out tea, coffee and passed round a tin of biscuits. Another photo opportunity. After this we returned to the job in hand. Everyone, that is, Phil. Pam, Kathy, Suzanne, Reg, Tony, Gordon, Colin, Jane and Jennifer, are to be congratulated for their unfailing determination to complete the task. It is fair to say that this is a job that should be carried out a little earlier in the year. but the sun finally came out! At mid-day, the tools were cleaned and returned to HQ. Well done everyone, a great effort. The next scheduled workday is Sunday, 4 December. Meet at HQ, located between the north bridge and The Seagull Lane gate, at 09.50, for a prompt start at 10.00. All volunteers, both regular and anyone else, will be warmly welcomed. Trained First Aiders will be on hand. Refreshments will be available. All necessary tools are provided and, where necessary training will be given. Sunday, a cold frosty sunny morning, but noticeably warming up as 13 volunteers arrived at HQ eager to do some work. 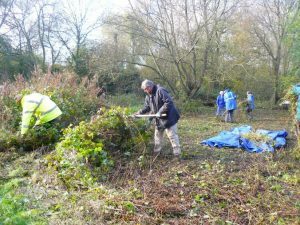 The main task was to complete the mowing of the Lumley wet area, a flower rich part of the east side of the Central Meadow. Maurice, appointed leader for the morning, explained the nature of the task and the hazards to beware of both environmental and in the use of tools. Three trained first-aiders were present. 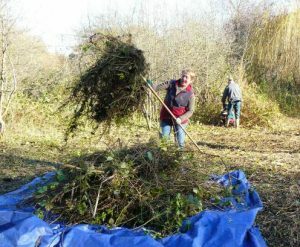 This is a hard task and needed most of the workforce to rake the arisings and carry them to composting area about 60metres away in the south east corner of the North Meadow. Mike set off with the power scythe whilst ten volunteers removed the grass. 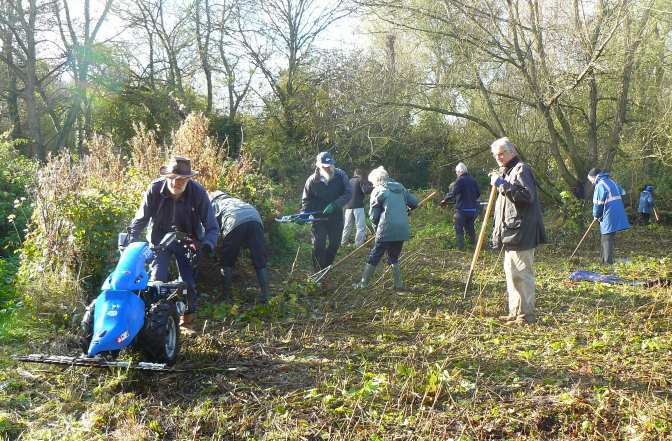 Photo shows Nigel using the power scythe with other volunteers clearing. 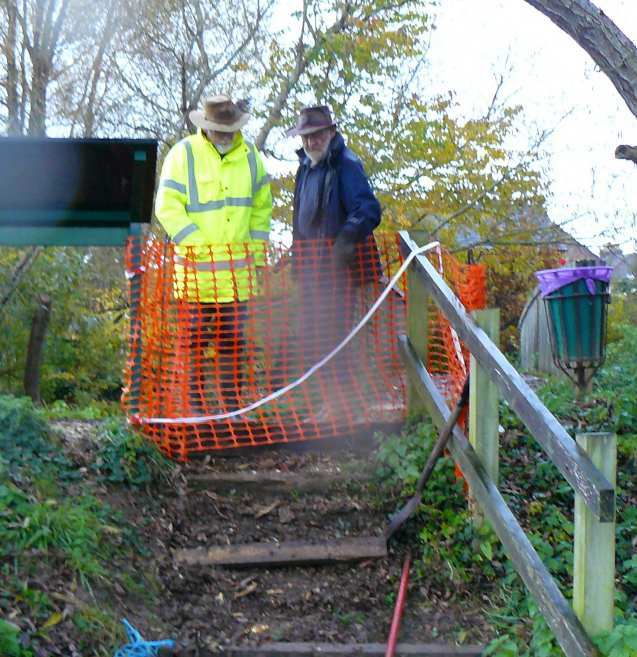 Meanwhile, Phil and Gordon started the job of reforming the badly decayed steps, near the east end of the north bridge. This turned out to be more difficult than had been anticipated. The job is to remove the existing timbers that form the front edges of each step and replace them with new larger timbers. It the process of removing the top timber and scraping away some of the material to make a lower surface for the new larger section to sit, it was discovered that there were old steel rods buried vertically in the ground. Having been there for some considerable time they were well and truly stuck. Digging them out would not only have been most arduous but would have disturbed the ground too much. So, with customary ingenuity, Phil devised a simple technique to remove them. Having exposed the top 7 or 8cms he made a rope cow hitch from the rope through the handle of a trowel and placed it around the exposed rod. Through the rope loop he placed a crowbar and using it as a lever lifted the longer end and demonstrated the benefits of a simple lever, and out came the rod. This procedure had to be repeated four times before the new timber could be located and then levelled and pinned in place. 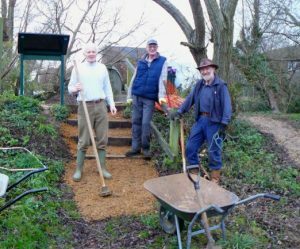 This done, Maurice packed the new timber with suitable path material, whilst Phil and Gordon repeated the same procedure on the bottom step. The intermediate steps will need to be worked on at a future time. The area was cordoned off for safety. 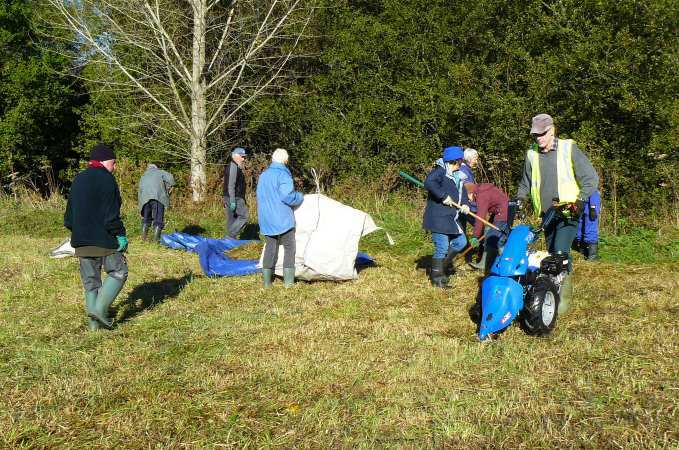 At 11.00 the weary volunteers welcomed a chance to lay down their, rakes, hay forks, clearance bags and other tools as it was time for a well-earned break. Pam, as always, the supplier of refreshments poured out tea, coffee and passed round a tin of biscuits. Thank you Pam. At mid-day the tools were cleaned and returned to their store. It is good to have both wild flower areas cut for another year. Well done everyone, a great effort. The next scheduled workday is Thursday 17 November. Meet at HQ, located between the north bridge and The Seagull Lane gate, at 09.50, for a prompt start at 10.00. All volunteers, both regular and anyone else, will be warmly welcomed. Trained First Aiders will be on hand. Refreshments will be available. All necessary tools are provided and, where necessary training will be given. Today’s work was overlooked by one of the magnificent Black Poplar trees that were planted in November 2004. Only two of these trees now remain, the third was planted too close to the Lumley Stream and died. They have grown to an astonishing height in just 12 years. 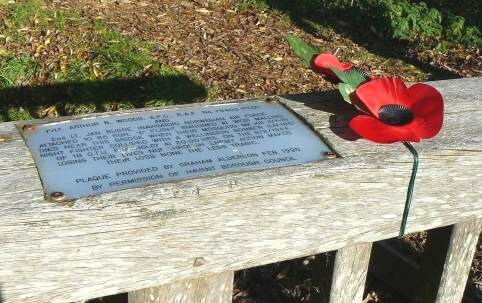 I also noted the poppies which at this time every year are attached to the north bridge by the plaque commemorating two airmen who died in an accident when two planes collided over Brook Meadow in February 1944. 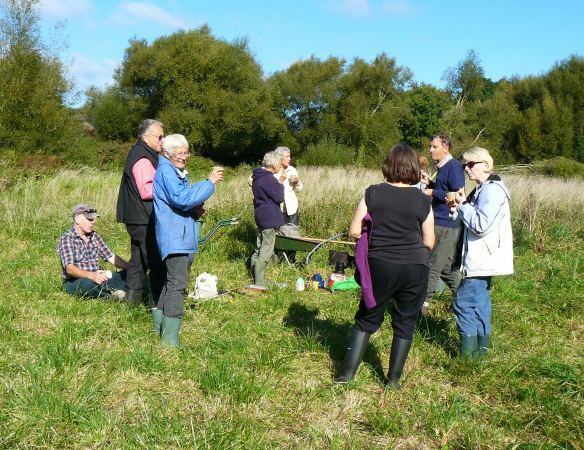 Ten Volunteers turned up for this session with the dull dry conditions becoming gradually warm and sunny. 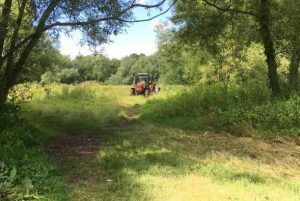 The main task for the day was to begin the cutting and clearance of the Lumley Wet area of the north meadow, our most valuable wild flower resource that we cut every year by Power Scythe,instead of the more damaging Tractor Cutting process. 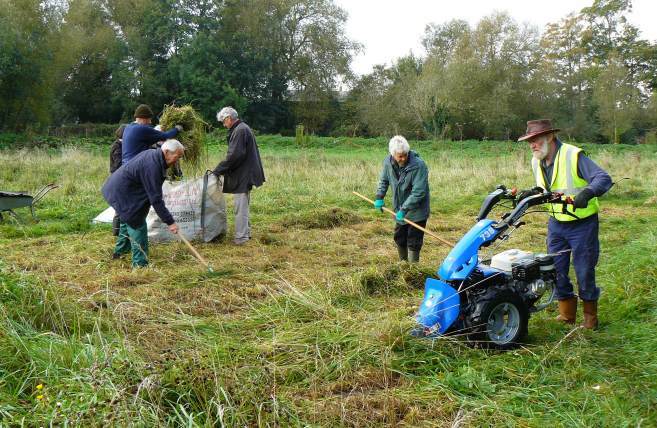 Whilst Phil began the Power Scythe cut, the other volunteers started the second task, collecting up the reptile mats, which had been located at strategic positions around the whole site for the summer reptile survey. They took the mats back to HQ for storage and possible reuse in future years. 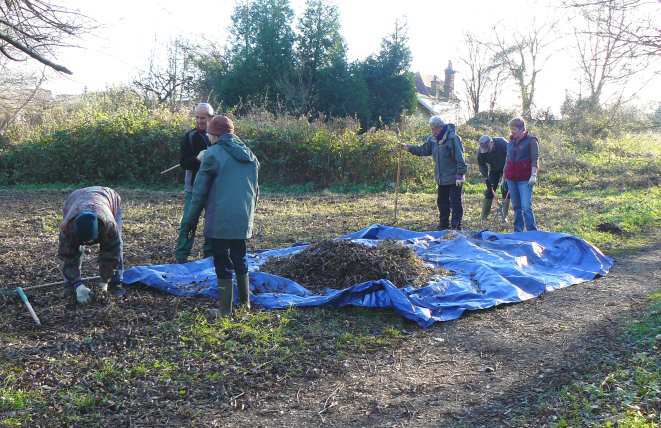 The whole team then joined Phil to rake, bag and remove to dump the cutting arisings, an arduous task. 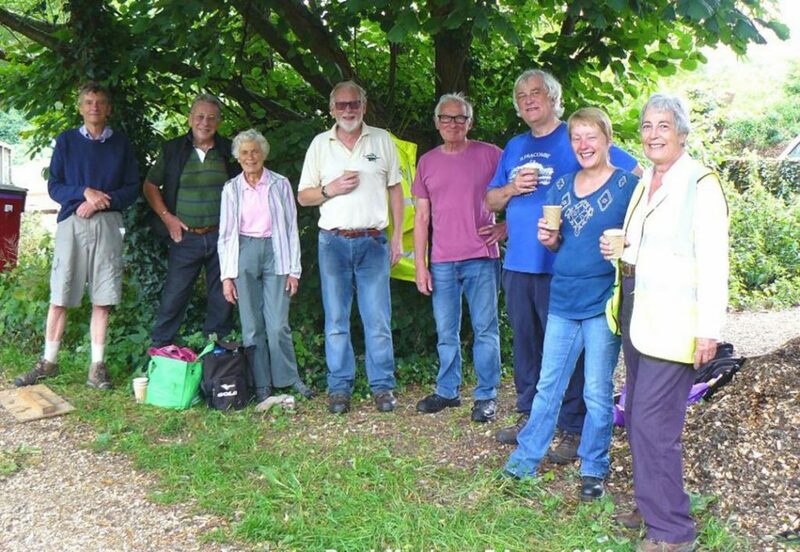 Everyone was really pleased to stop after the first hour, so that Pam’s refreshments could recharge our batteries. Next, Phil took a break from machine driving to explain the Power Scythe controls to potential new drivers Colin, Tony and Dan, with Jennifer ready to take over the driving for a spell. Before the work session ended, all 3 ‘learners’ were given some ‘hands on’ driving / cutting instruction and hopefully they will all be able and willing to get some more experience on future work days. 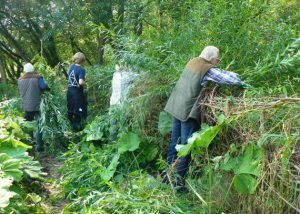 By midday we took pleasure in looking back at our achievement, with almost half of the patch cleared and the remainder left for the next volunteer session noted below. Many thanks to all of the volunteers and we hope to see you all again. A chilly start this morning but it soon warmed up with the sun. Eleven volunteers, including one new lady volunteer, assembled at the new tool store (HQ). Today’s main objective was to finish off cutting and clearing the orchid area, preparing it for next year’s growth. Our new power scythe is proving to be a very valuable asset. The scythe was ably managed by Nigel and Phil. Here is Phil taking his turn. 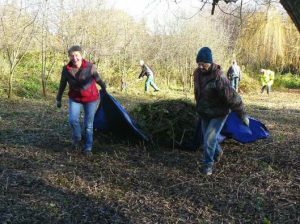 The rest of the team were engaged in raking up and bagging the arisings and hauling them away to the dump. 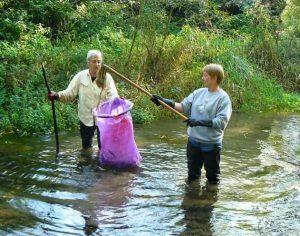 Meanwhile Jennifer and Debi donned their waders and cleared the river under and around the south bridge and further north. So much rubbish and branches that had accumulated in the last few weeks. They both returned to the hut soaking wet. Fantastic job ladies. 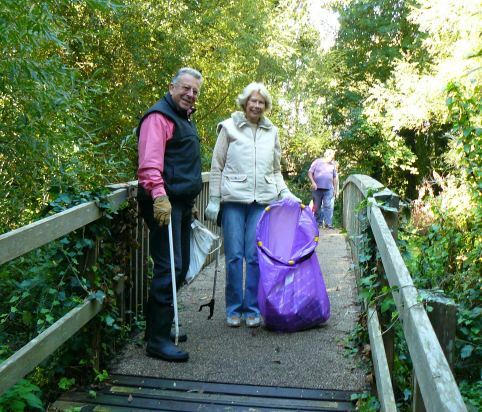 A big thank you to Joan and Bob for a sterling litter pick . The usual thank you to Pam for tea, coffee and biscuits. And a hearty and big thank you to everyone else – Brian, Bob, Colin, Phil, Ute, Nigel, Kathy, Pam and Brenda. A very warm welcome to our two new volunteers Kathy and Brenda. And lastly thank you to all the volunteers that always make it such a fun morning. It was a sultry Thursday morning, hot and humid with an increasingly present sun. 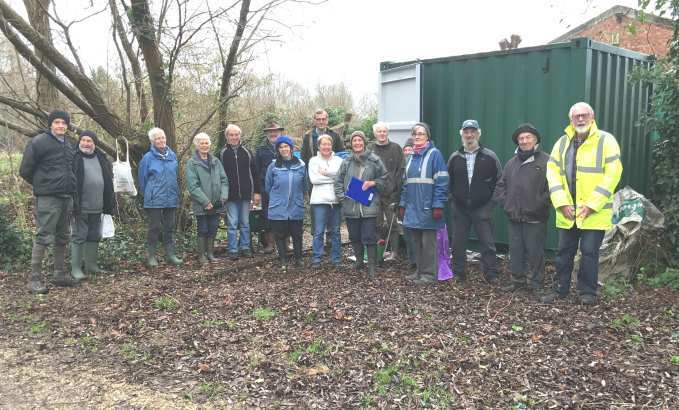 Twelve volunteers, (Maurice Lillie, Pam Phillips, Suzanne Holroyd, Phil and Ute Wilde, Kathy Edwards (a new volunteer) Mike Probert, Tony Browne, Wally Osborne, Dan Mortimer Jane Shorrock and Jennifer Rye), assembled at HQ eager to do some work. Little did they know that it was to be a session of the hardest job we ever tackle; grass cutting and raking. Maurice, appointed leader for the morning explained the nature of the task and the hazards to beware of both environmental and in the use of tools. Three trained first-aiders were present. The meadow to be tackled was the flower-rich area, a.k.a. the orchid area in the North Meadow. 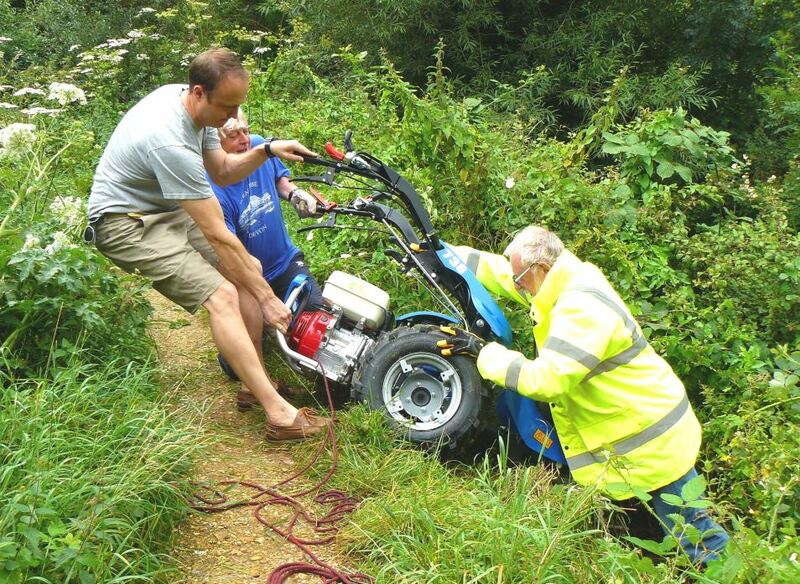 Because of the enormity of the task it was decided that it was “all hands to the pump” so no litter picking was done. We remembered the sad loss of Frank Styles, who was the most regular of litter pickers at our work days. Maurice had started cutting before the official start so that the raking could begin immediately after the briefing. So as to maintain a supply of material to collect, Mike, continued mowing for 35 minutes, whilst everybody else raked, bagged and dragged the long grasses, short grasses, abundant ragwort, meadowsweet, a few nettles and brambles plus mares tail and the remains of many other dying wildflowers that inhabit the area, now that they have seeded. 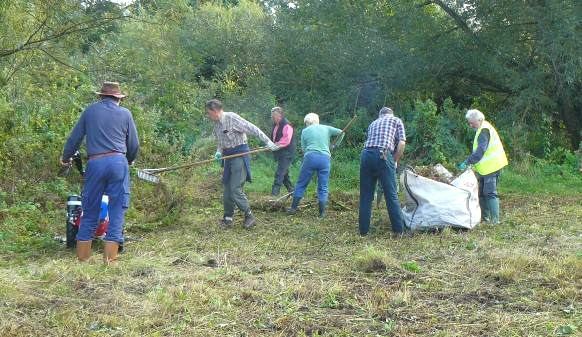 At 11.00 the weary bunch welcomed a chance to lay down their, rakes, hay forks and clearance bags as it was break time. Pam, permanent supplier of refreshments doled out tea, coffee and biscuits. Thank you Pam. Dan took the opportunity of everyone being assembled to remind us of the group of people who are getting together on Saturday and Sunday for a few weeks, to paddle about, suitably attired, in Peter Pond to start the huge task of moving silt from the wide areas on the east and west sides of the pond, towards the channel so that it can be washed out to sea with combined help of the Lumley Stream and the high tides. 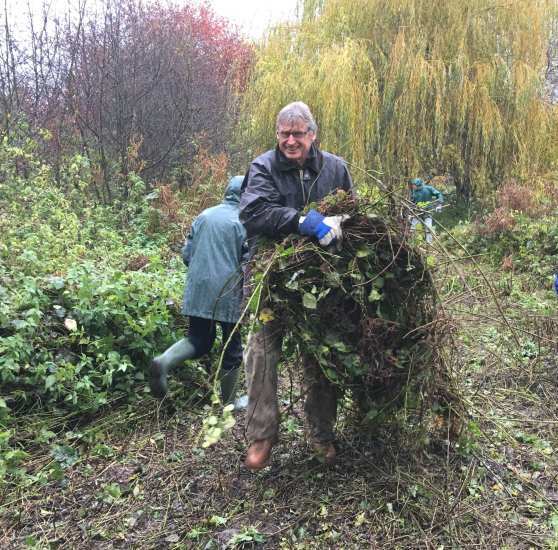 Afterwards the break, Phil took over the power scythe for a short while and continued to cut the wildflower area, whilst as before, the other volunteers raked the mowings and removed them to the composting areas. At midday the tools were cleaned and returned to their store. It is amazing that we cut about two thirds of the area. Well done everyone, a great effort. This must be continued at the next sessions to promote next year’s growth. The next scheduled workday is Sunday 2nd October. Meet at HQ, located between the north bridge and The Seagull Lane gate, at 09.50, for a prompt start at 10.00. All volunteers, both regular and anyone else, will be warmly welcomed. Trained First Aiders will be on hand. Refreshments will be available. All necessary tools are provided and, where necessary training will be given. On this morning’s walk through Brook Meadow I was pleased to meet up with Jack, a member of CSA, the Ecology firm, which is carrying out the reptile survey on Brook Meadow. Jack was checking the black mats that had been scattered around the meadow for any reptiles which might be hiding beneath them. Jack said he had already found a good number of Slow-worms under the mats, mainly in the north west sector of the meadow which is a ‘hot spot’ for them. They included males, females and juveniles. Jack explained how to distinguish between male and female Slow-worms. When Slow-worms are born they all have black flanks which are kept in females as they mature, but not in males, which always have clear flanks. 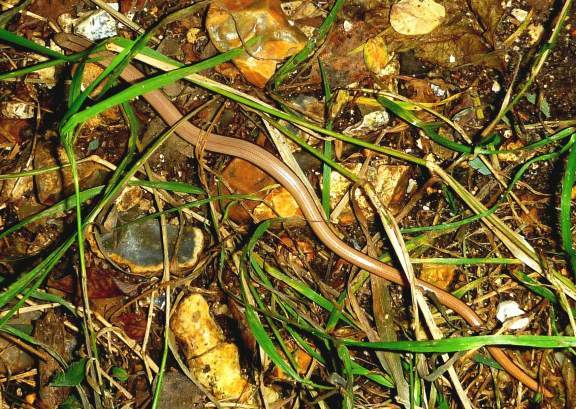 Here is a young/female Slow-worm with dark flanks taken by Maurice Lillie on Brook Meadow in 2010. Jack said he had not found any Common Lizards, which I was not surprised at as we have had no sightings of them at all this summer, despite seeing lots the previous summer. 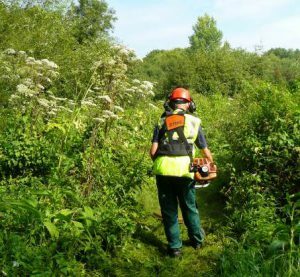 CSA, the ecology firm who organised reptile translocation on to the Meadow last summer, are required to re-survey the site a year later to determine how many reptiles have survived. They do this by a sampling method in which black mats are distributed around the site; the mats generate heat underneath which attracts the reptiles. The count reveals the rough percentage of survivors still present. Whether to carry out further relocations will depend on the results of the survey. 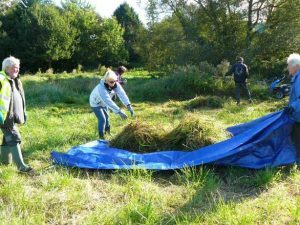 9 volunteers were welcomed on to the Meadow at 10 a.m., and tasks for the day were described by Jennifer, who was leading. 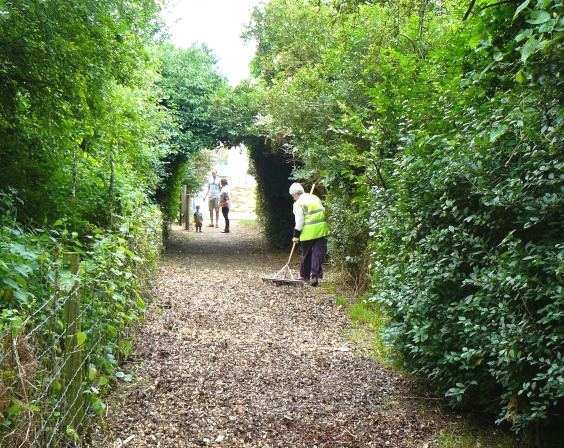 The main task was to start cutting the enormous amount of growth on the Seagull Lane patch, raking up the arisings, and dragging them to the disposal site near the railway line. Nigel took first turn on the power scythe, and others cut carefully around the newish oak trees with shears. 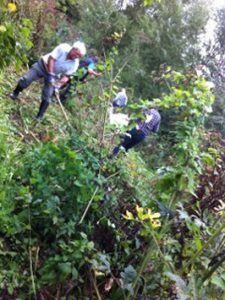 Meanwhile Debi took two volunteers to the Palmers Road copse, where they finished the cutting back done recently by HBC, by clearing the path from the centre of the car park to the riverside walk. 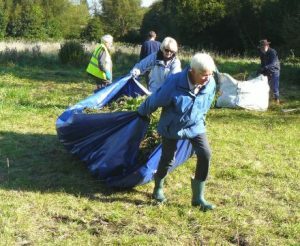 Then it was all volunteers to the raking and dragging job. By coffee time the area from the main path to the second oak had been cleared. Of course the reptile inspection mats had to be lifted out of the way, and replaced when the cutting was finished. 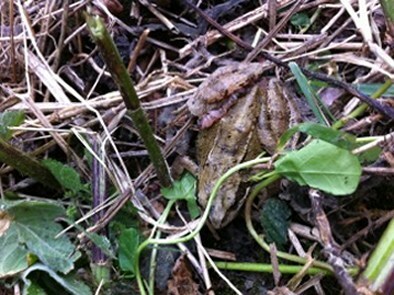 Under the mats, three slow-worms were spotted, and one small furry creature, a vole or maybe a shrew. A frog hopped ably out of the way of the scythe, ably assisted by Martha. 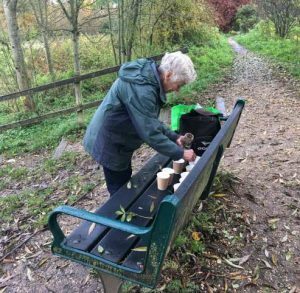 Coffee and biscuits were served at a ‘bistro table’ which was on its way back to Debbie Robinson, who had loaned it for the Emsworth Show. We were all grateful to Bob who had brought the coffee packs from Pam’s house for us, since Pam was busy at an all-day dog agility event. After the break, Phil took over on the scythe, others did the other tasks, while Debi Saunders, Jennifer and her granddaughter Martha cleared the large willow logs, which had been rolled into the river at the dog splash zone, back up to the log pile left by the tree surgeons who have recently cut back willows between the industrial estate and the river Ems. They then covered the log pile with wood chippings, and added a final scattering of brambles, to deter more antisocial activity. Logs must not be left in the river, as when the water level rises they will float downstream and block the exit under the Old Flour Mill into Dolphin creek. 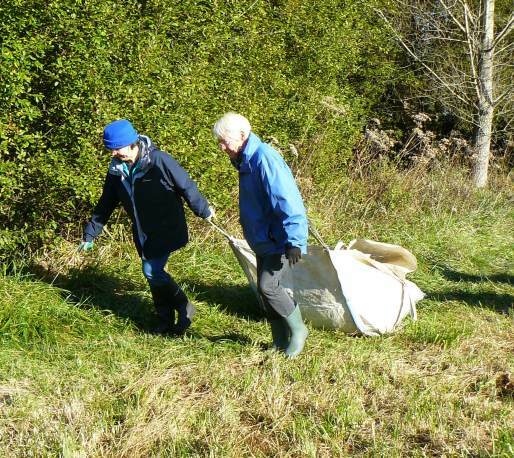 Dan had done a general litter clearance in the meadow, then he and Martha and Gordon went to rescue the wasp nest warning notices which had been similarly chucked into the river. 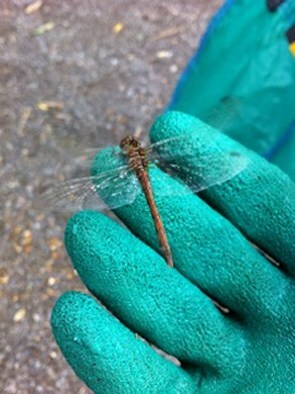 Martha rescued a drowning Banded Demoiselle which had been blown into the water. 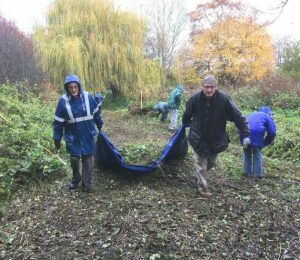 We succeeded in cutting about two thirds of the Seagull Lane area; tools were cleaned and returned to HQ, and the morning ended shortly after noon. From what I can judge this year’s annual Bank Holiday Emsworth Show was a roaring success after two particularly poor years due to bad weather. Today, the weather was perfect, warm, sunny periods, but not too hot and no rain. And there were lots of visitors. 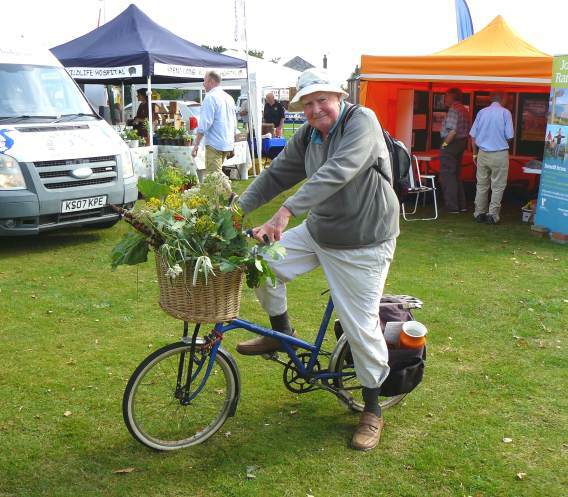 I took along a basket full of wild flowers on the front of my bike which I had picked on the morning from Brook Meadow. 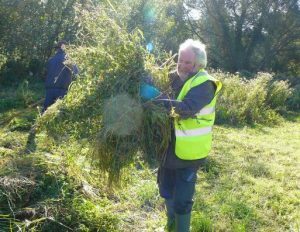 They included mostly late flowering plants, like Common Fleabane, Hoary Ragwort and Wild Angelica and a selection of twigs from Rowan, Alder Buckthorn, Hawthorn, Oak, Ash and Osier Willow. I had intended putting the flowers into vases, but when I arrived everyone said they should be left in the basket on my bike where they looked quite splendid. In fact, they attracted a lot of attention during the day with people stopping at the stall to ask questions about them. 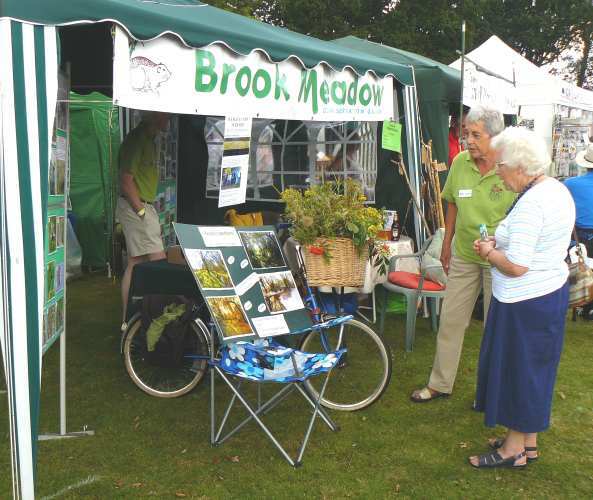 I thought the Brook Meadow Conservation Group stall was as attractive as I have ever seen it and in a much better position than last year with space all around. 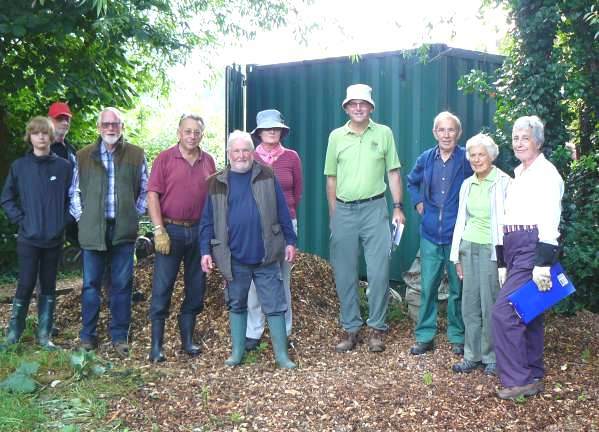 We shared the plot with the Emsworth Memorial Garden, the British Trust for Ornithology (run by John Goodspeed) and the RSPB. 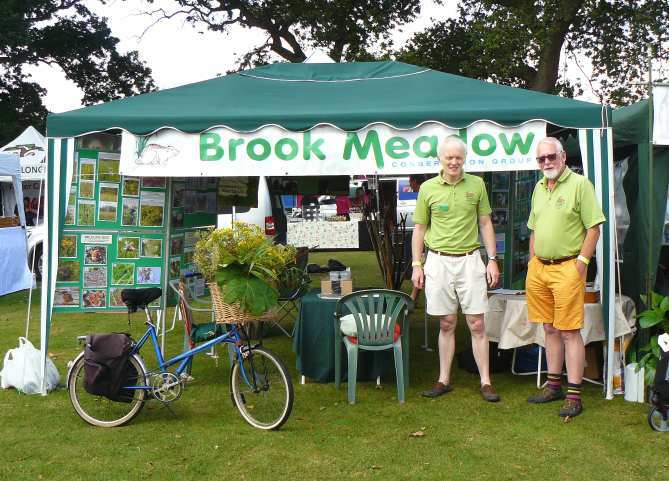 Here is a shot of the front of the stall at the start of the show manned by David and Maurice. 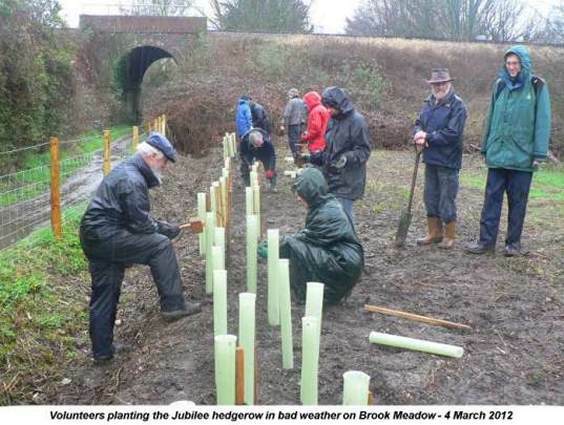 One innovation this year was an invitation for people to vote for the ‘people’s postcard’ from a series of four beautiful photos produced by John Tweddle depicting the four seasons of the year on Brook Meadow. This was Debbie Robinson’s idea. In addition, a copy of John’s postcard was given free to every person renewing their subscription to the group. Here are Jennifer and my wife Jean discussing the merits of the four pictures. So the winner, vote wise, is Autumn, but Winter brought in the most money by a long way. We shall discuss producing a Christmas card from the Winter view with John. Maurice Lillie also brought along for sale a variety of thumb sticks that he had made from different species of tree, including some from Brook Meadow. Pam Phillips reports that 15 existing members renewed their membership and one new member joined at the show. Two books were sold and two of Maurice’s thumb sticks. 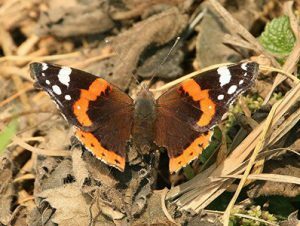 CSA, the ecology firm who organised reptile translocation on to the Meadow last summer, are required to re-survey the site a year later to determine how many reptiles have survived. They do this by a sampling method: black mats are distributed at key sites, which, because they generate heat underneath, attract the reptiles. The count reveals the rough percentage of survivors still present. To this end CSA have distributed a large number of these mats around the Meadow: 39 in the Seagull Lane Patch, 85 in the North Meadow and 27 in the Central Meadow as shown in the accompanying sketch map. Explanatory notes have been put at each end of every ‘run’ of mats. It would be helpful if members walking through the Meadow ensure that the mats are not interfered with, especially not moved or thrown into the river! Perhaps they could explain the presence of the mats to visitors who express an interest too. Martin Cull made a start on the annual cut of the grassland today. 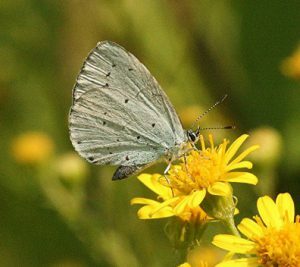 He will also collect the arisings from the cut areas and dump them in designated parts of the meadow. 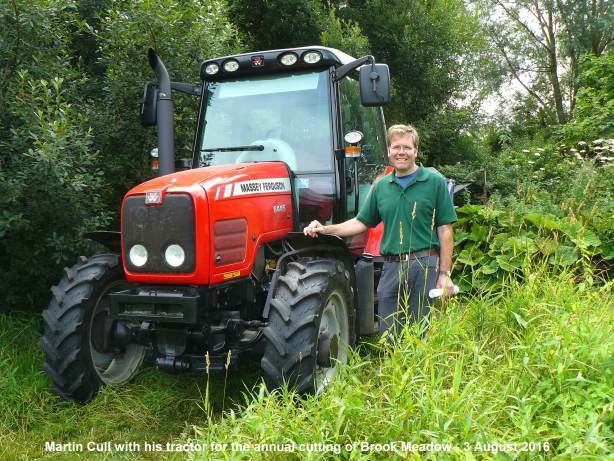 The photos show Martin with his bright red tractor and starting work on the cutting. 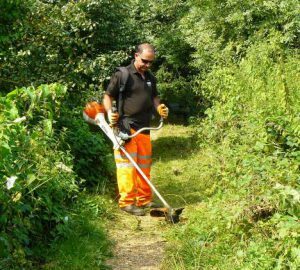 As in previous years, the cutting will be done in line with the policy of mosaic cutting, where some areas are cut and others left uncut. 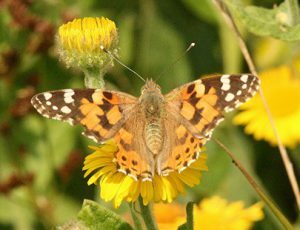 The more ecologically sensitive areas of the meadow, such as the orchid area in the north meadow and the Lumley area will be cut later by the conservation group when seeds have set. 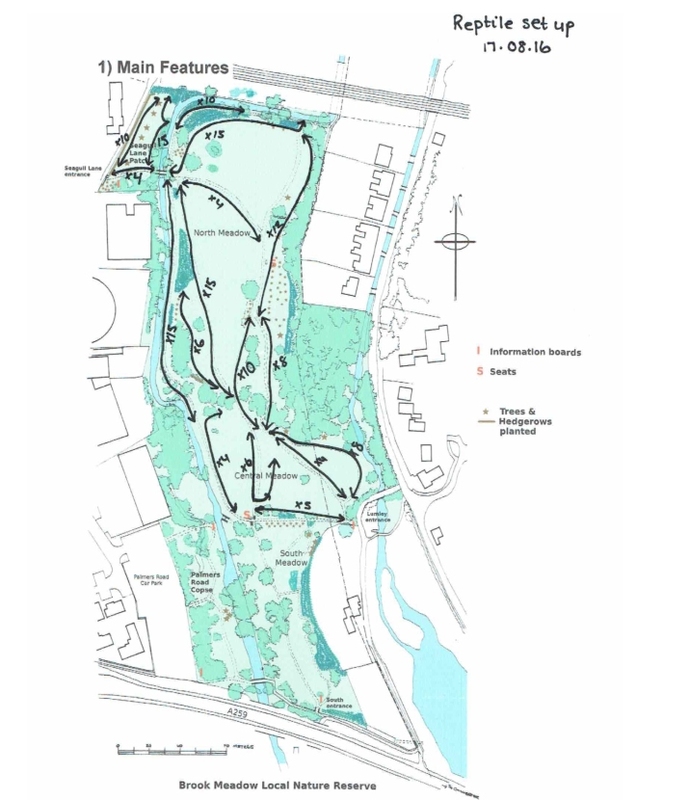 Here is the mowing plan for Brook Meadow. The areas for cutting by Martin are marked in red, those for later cutting by volunteers in green. Areas not coloured will be left uncut this year. The following photos were taken later this afternoon when Jayne Lake of Norse (HBC) arrived to see how the work was progressing. 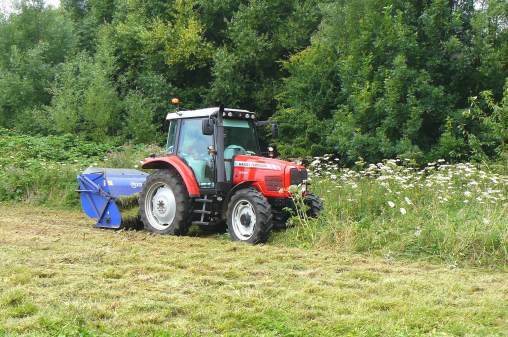 Martin had already completed the cutting of the designated area of the centre meadow. He made a start cutting the north meadow as shown in the right hand photo and will return to complete the work early next week. 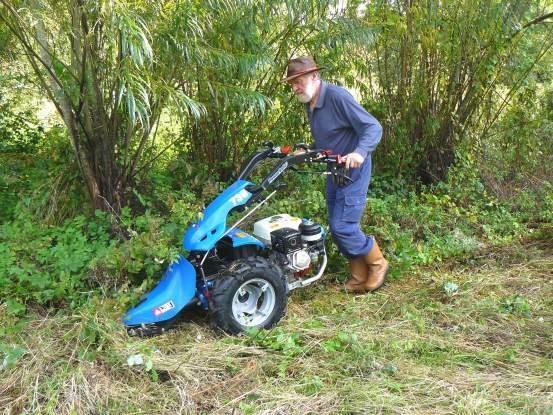 Martin Cull was back on the meadow today to complete the annual cutting of the grassland. 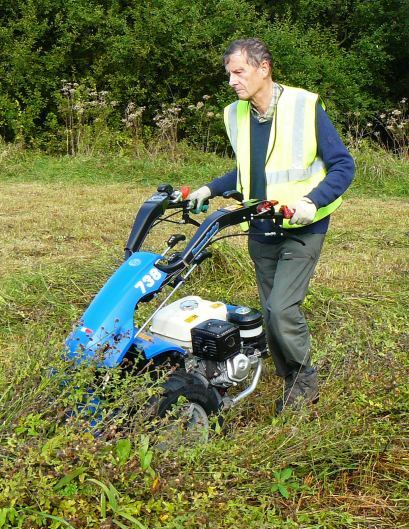 Martin did the centre meadow on Wednesday and today he was busy cutting the northern part of the north meadow and dumping the arisings on a new area on the west side near the north bridge. 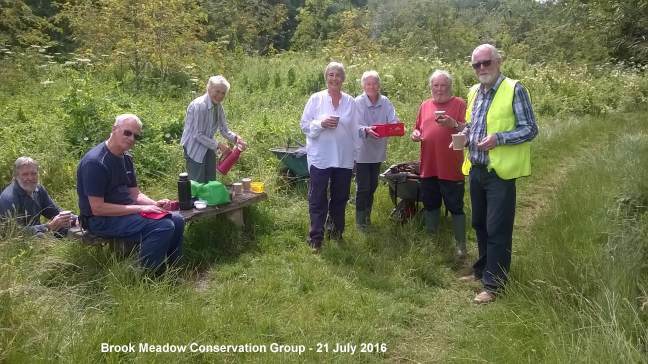 Martin and his father Brian have done a very good job over the years in helping to keep the meadow in reasonably good shape. 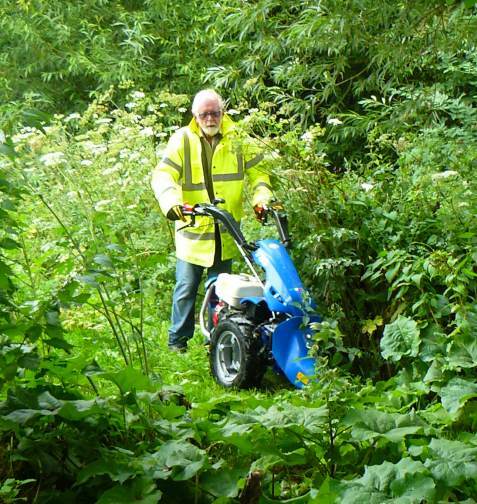 Martin cutting the northern edge of the north meadow. 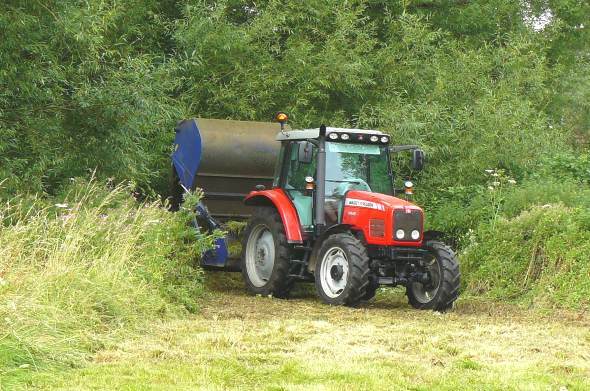 Martin dumping the arisings on the side of the meadow. 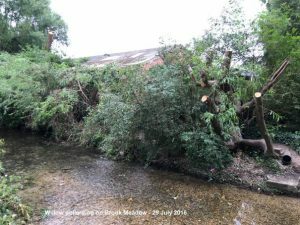 The pollarding of the tall willows on the west side of the River Ems behind the Artec factory is now finished, but lots of hefty branches have fallen across the river which need to be removed. 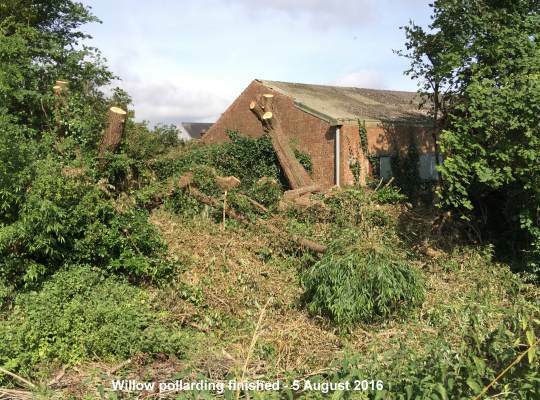 This photo shows pollarded willows at the south end of the factory. Maurice Lillie is negotiating with the Environment Agency about clearing them as they could well contribute to water flow problems as well as affecting the river habitat for Water Voles and other wildlife. 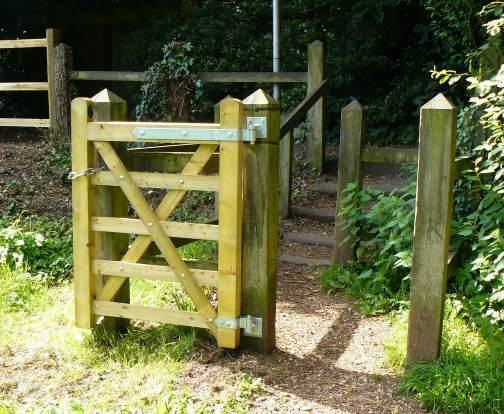 As planned the Environment Agency has erected a new gate at the bottom of the steps at the southern entrance to the south meadow. This gate will normally be kept open except when the south meadow is flooded when it will be locked to prevent public access. Report by Mike Probert. Photos by Brian Fellows. 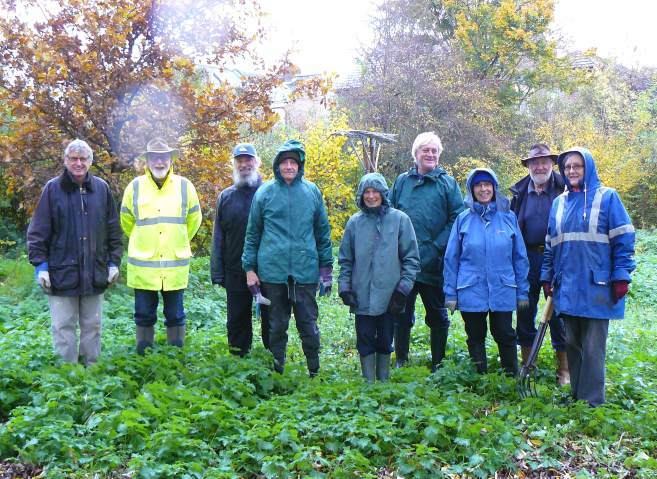 Ten volunteers gathered in warm, damp conditions after overnight rain. 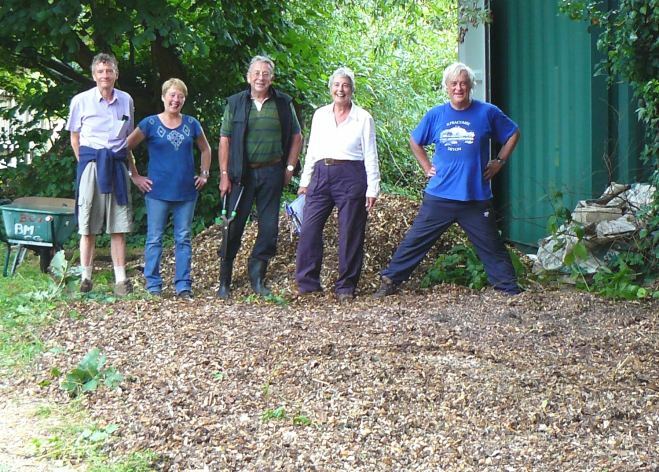 One team energetically barrowed woodchips from the pile by HQ along Seagull Lane to fill the dips and depressions ahead of winter. 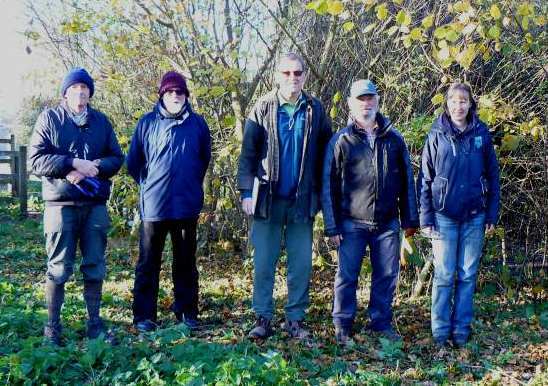 Another team cleared the tangled vegetation around the Hazel copse stools to let in some light and air. 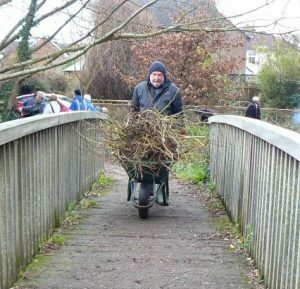 They then proceeded to trim the fast growing willows along the main river path by the sluice. Here they are with the job finished. 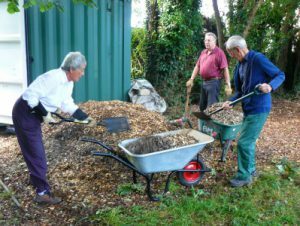 The ‘woodchip crew’ completed their first task and then started to mulch the Hazel stools before teatime. In parallel, Dan gave the signcases a good clean. 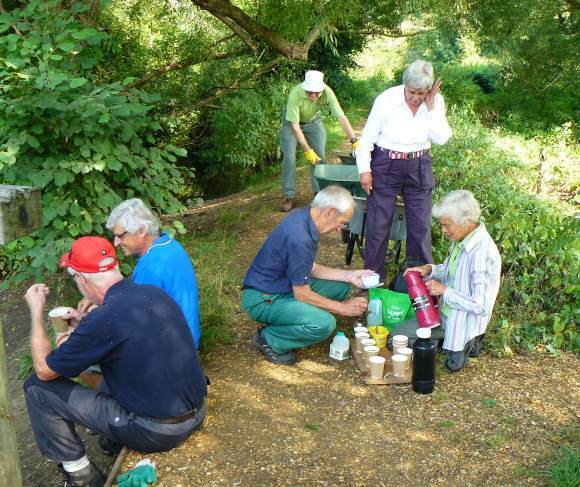 Pam provided a welcome tea break on the riverbank away from the flies before the mulching of the Hazel stools was completed. 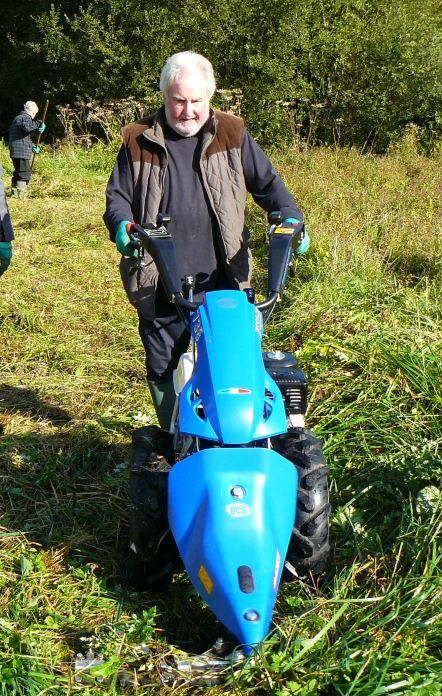 Wally strimmed the transverse paths in the South Meadow, followed by a rake-up of the cuttings. A Norse (HBC) worker (right hand photo) was also strimming the edges of the main paths. A warning notice was placed near a wasp nest on the north path. A good morning’s work in humid conditions. A reptile survey is underway. 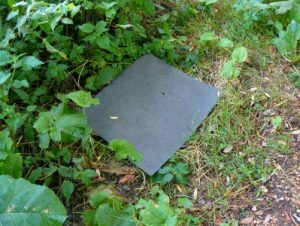 A large number of black felt mats have been placed around the meadow by the ecological team that arranged for the reptile relocation earlier in the year to check on how many have survived. 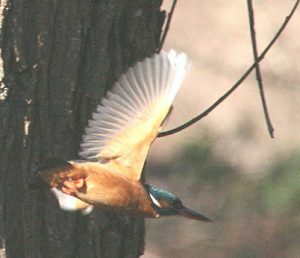 Kingfishers are returning to the harbour areas after their breeding season. Pam Phillips saw one on the Lumley Pool yesterday and Michael Probert saw one on the river near the north bridge this morning. They are usually best seen around the millponds in winter. Here is one taken earlier this year by Malcolm Phillips. 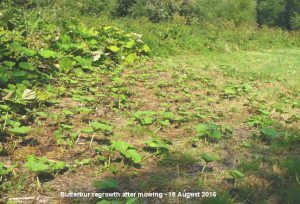 It was interesting to see the regrowth of Butterbur on the meadow below the main seat only a couple of weeks after it had been mown. 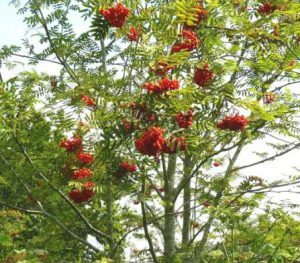 The Rowans on the east side of the north meadow are covered in red berries. 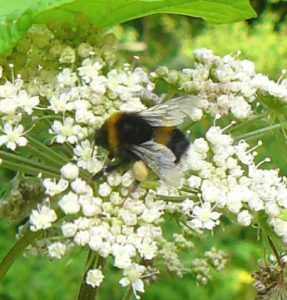 The Wild Angelica flower heads are highly attractive to a variety of Bumblebees, including this fellow with bulging pollen sacs on its legs. 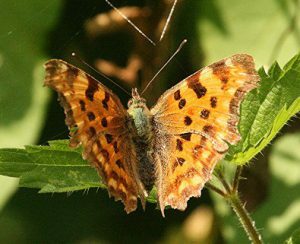 Malcolm Phillips was out on the meadow again today and got some excellent images of butterflies: Comma, Holly Blue, Painted Lady and Red Admiral. Report by Jennifer Rye. Photos by Brian Fellows. Sunday dawned cool but muggy, fortunately the rain overnight had cleared in time for us to start on time. 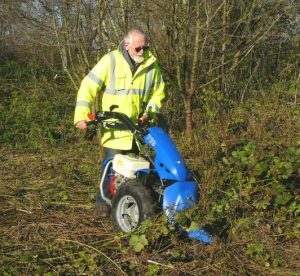 Before the start of the work session Maurice had got ahead with cutting most of the central meadow green paths with the power scythe. 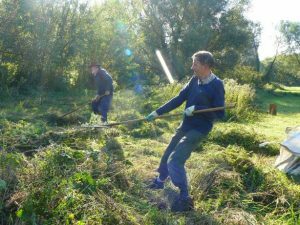 However, while cutting the north path, the scythe had inadvertantly slipped partly down the river bank, so Maurice and Gordon, ably assisted by a meadow visitor, hauled the scythe up the river bank. 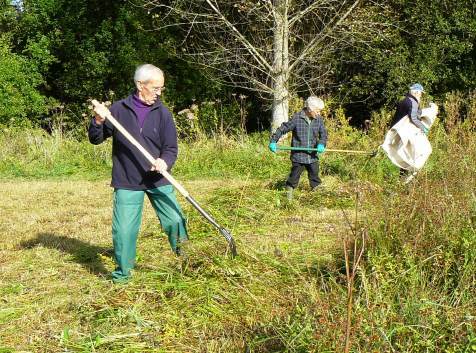 The scythe was working fine when Maurice was later cutting the path through the Seagull Lane patch. 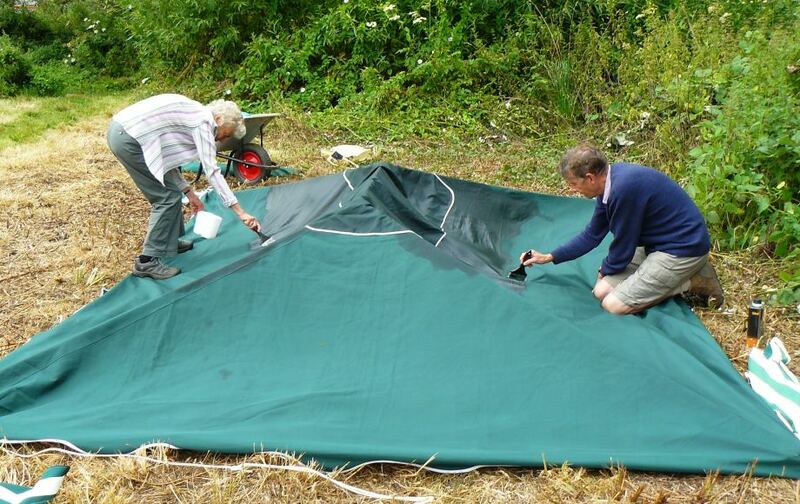 The gazebo which proved to be no longer waterproof at the Emsworth Show two years ago, was spread out and reproofed by Pam and Colin. This was done in the newly cut section of the north meadow. The main task for the day was to shift the larger pile of wood chippings which had been left beside HQ by the firm of tree surgeons employed by Artec Engineering to ‘pollard’ the willows along their section of the western bank of the Ems. We had managed to prevent even more being left there by warning them that they were not wanted by us at this season of the year. A smaller than usual band of volunteers managed to complete this task, but it took the whole morning. Here are before and after shots of the wood chippings pile. Here is a link to a short video of the ongoing work . . . 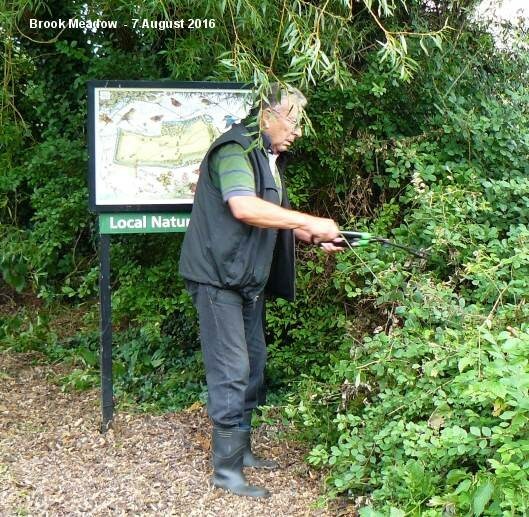 Meanwhile, Bob trimmed off brambles near the interpretation board to allow easier access for visitors. 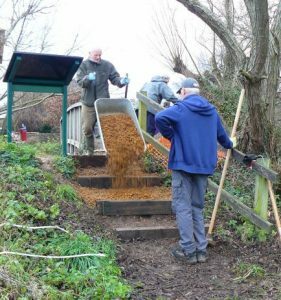 The spots in the unsurfaced section of Seagull Lane which get muddiest in the winter months were covered with a thick layer of wood chippings, also the whole section of the meadow between the gate and HQ. 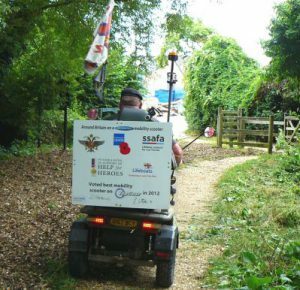 Frank did his usual heroic litter clearance and Pam provided extremely welcome refreshments, as well as clipping overhanging vegetation from several footpaths. 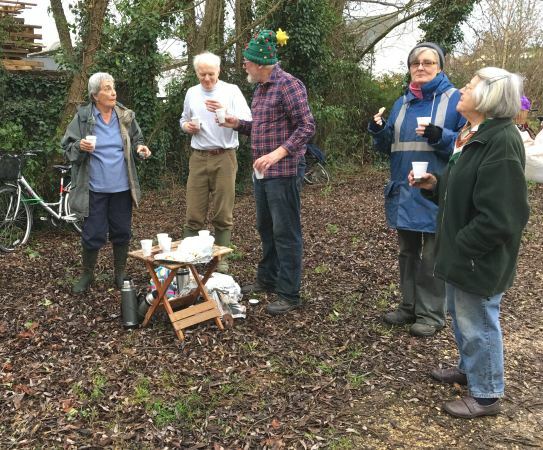 Volunteers having a coffee and biscuits break. Dave Lee turned up just in time for the group photo! Honour is due to Maurice, Pam, Colin, Debbie, Bob, Frank and Gordon for their sterling efforts today. At the end of the work session we had a surprise visitor in the form of a soldier who was visiting war memorials Britain on a mobility scooter. 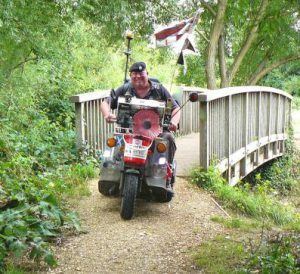 His objective on Brook Meadow was to see and photograph the plaque on the north bridge commemorating the two airmen who were killed in a plane crash over the meadow in WW2. He did this and was off in a flash! 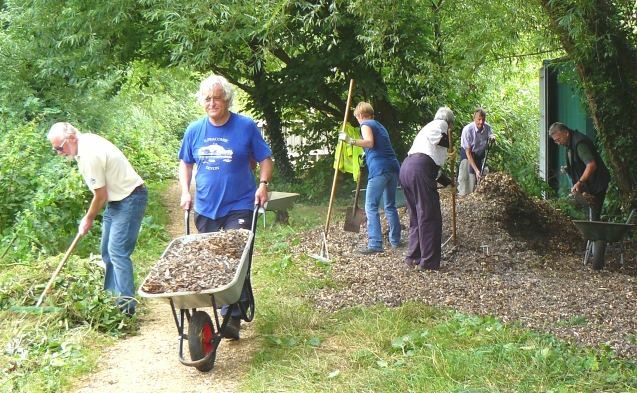 Next work session will be Thursday 18th August, 10 till 12, new volunteers always welcome. Meet at the Seagull Lane gate, and admire the newly surfaced entrance way. 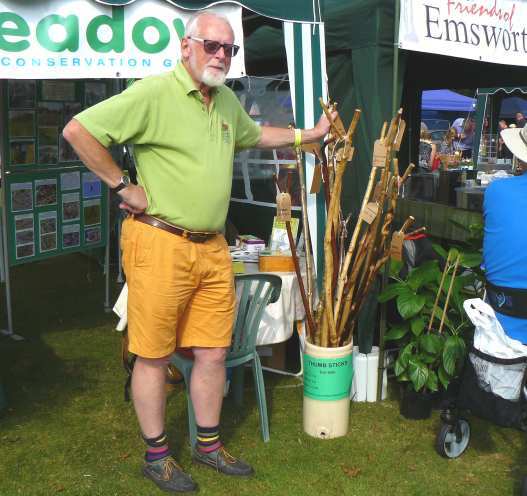 And don’t forget to call in at our stand at the Emsworth Show on Bank Holiday Monday August 29th, and take the opportunity of renewing your membership there. 1 South Bridge. 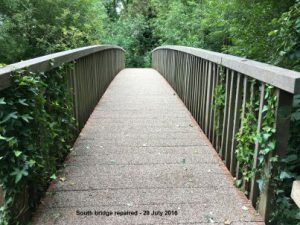 Having monitored the continuing deterioration of the walking surface of the south footbridge over the River Ems, for a couple of years, we were surprised. about three weeks ago to be told by HBC, that work would start shortly on carrying out repairs to the bridge. This necessitated closing the bridge and a short section of footpath. A few days ago, Jayne Lake now of Norse CS invited us to inspect the works in progress, with her. We were pleased to note that after only three day’s work, considerably shorter than anticipated, a completely new walking surface had been laid over the bridge part. This left the eastern and western approaches to be renewed similarly. The path is currently open again to pedestrians. Norse CS is a private company which has taken over the responsibility of carrying out a multitude of external services, previously carried out by the Council. Whilst carrying out this work the contractor is able to inspect the main structure beneath; a necessary task, to reassure HBC on behalf of the general public, that the bridge is safe. 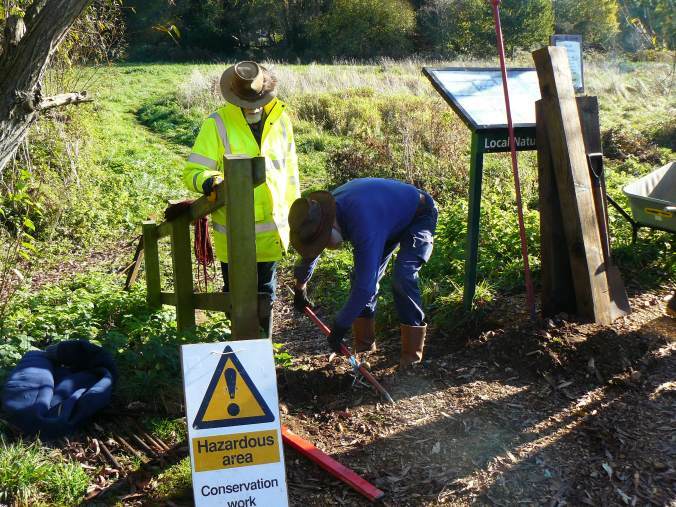 The job will be completed very shortly and the path reopened to enable the public to enjoy, once more, the pleasant walk past the edge of the meadow. 2 New Fence. 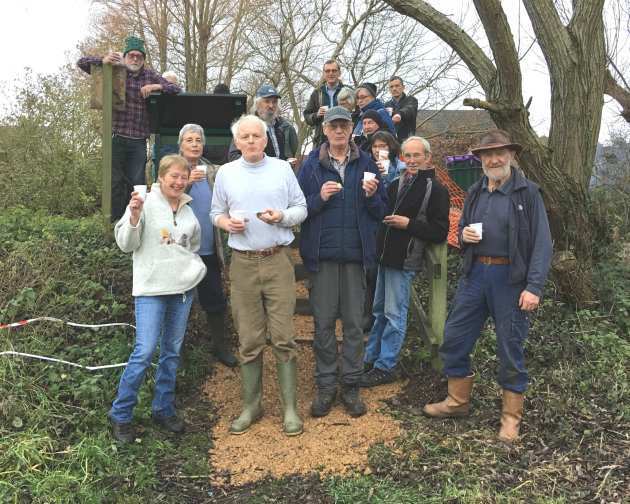 With remarkable coordination the tumbledown post and rail fence, along the southern edge of South Meadow, has been renewed by the Environment Agency. 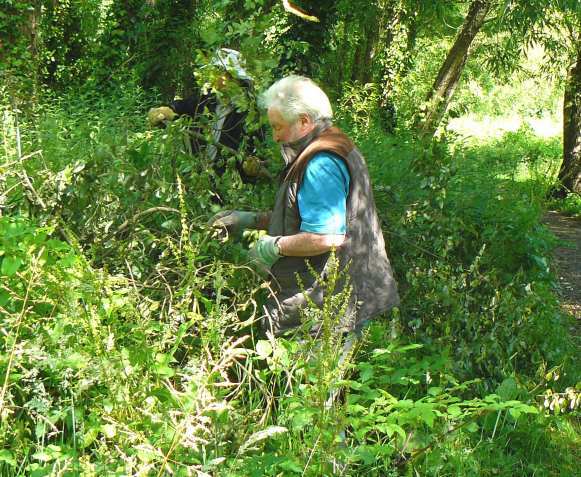 The bramble plants on the meadow side of the fence had to be removed to enable the work to be carried out. Sadly, the annual crop of blackberries will not appear this year, but they should return in a year or two. It is also expected that wild flowers that grew along the soft edge of the path will also return. BMCG will need to monitor this to ensure that minimal strimming only, is done, so as to promote the best habitat along there. 3 Latest Flood Mitigation Works. 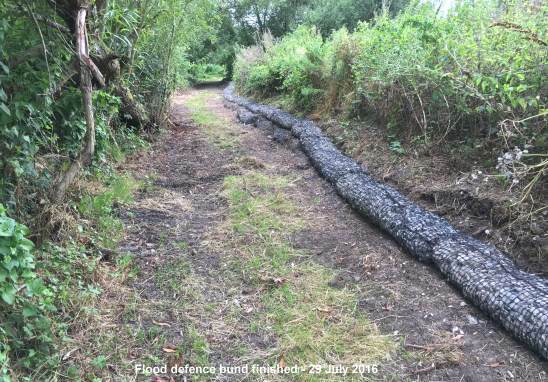 As previously reported, the Environment Agency (EA) is carrying out a number of flood mitigation projects in conjunction with and on behalf of West Sussex, Hampshire, Southbourne Parish and residents of part of Lumley Road. The latest project is the finalisation of the reinforcement of the foot of the bank along the west side of Gooseberry Cottage. Phase one of this was carried out last year. The access to this latest phase was somewhat wider than expected. 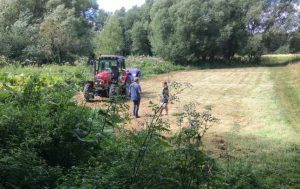 The effect of this was to cut down at least two areas of wild flowers that we had hoped could be avoided unless the work could have been carried out after the relevant plants had seeded. It is hoped that, as the plants are perennials they will return next year. The wide path, created by the need to access the construction work, will be allowed to become considerably narrower by the natural growth of plants in the area. This will not happen very quickly, but by this time next year the whole area will look more natural. This time frame will also give the stone ‘sausages’ time to weather down and with a bit of encouragement become covered by wild flowers and herbs that abound nearby. 4 New earth bank CSA, a company with whom we worked a year or two ago in regard to our becoming a receptor site for endangered invertebrates, have been commissioned to carry out an ecological survey and prepare a mitigation proposal for the north meadow, in advance of a planning application for the construction of a new earth bank. This bank will be approximately 1.2metres high and run in the least harmful location from the north east corner of north meadow, southwards towards then behind the Rowan Grove before turning towards the Lumley branch of the River Ems. This will be the final step in the protection of the Lumley terraced cottages from the effects of flood water, that are predicted to occur sometime in the future. 5 Pollarding of trees adjacent to the river. During this last week, we were somewhat alarmed to see several trees being substantially reduced in height along the west bank of the River, immediately south of the north bridge. Whilst BMCG has no responsibility for the trees along there, we have an understanding with Norse CS/HBC that any news on similar subjects is shared between us. 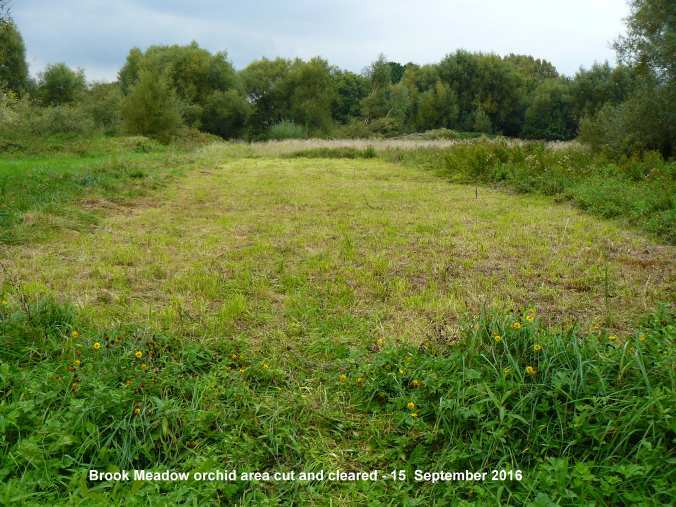 BMCG particular interest in this case is that the bank is quite narrow and has in the recent past been a habitat to water voles, whose existence is officially treated as rare and endangered. 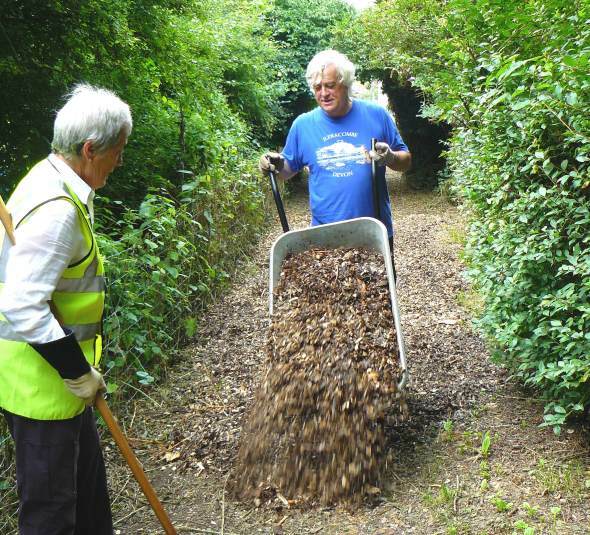 We were also surprised to receive several unsolicited tonnes of wood and leaf chippings. It is hoped that these chippings can find a new home and soon. BMCG uses this material to make saturated soft paths, passable, particularly in winter. However, not the sort of quantity which has been dumped on us. One benefit of this tree work, apart of course, from eliminating the risk of branches crashing onto the factory roof, is that the overshadowing of the river banks is now, considerably more obvious and will stimulate clearance work to allow low level river bank vegetation to grow as fodder and refuge for water voles. The work has been described as pollarding and the extent of this is from the corner, near our Tool Store, a.k.a. HQ, south to a dead ash tree, behind the site of the old gasometer. The purpose of pollarding is to reduce tree height to a ‘safe’ level and allow shoots to develop to restore a softer skyline, albeit somewhat lower than before. 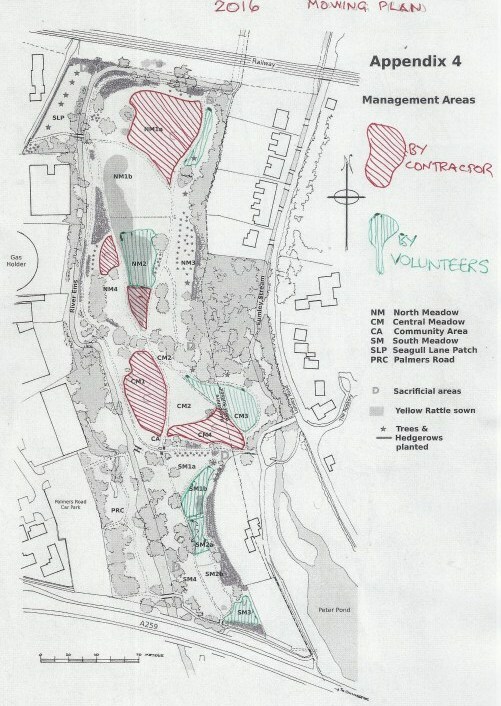 Over the next few years, it is anticipated that more pollarding will happen over other areas of the meadow. The tree surgeons were back at work on the meadow pollarding the willows along the west bank of the river behind the factories. Maurice said the work was stopped temporarily due to the Artec factory being on holiday. 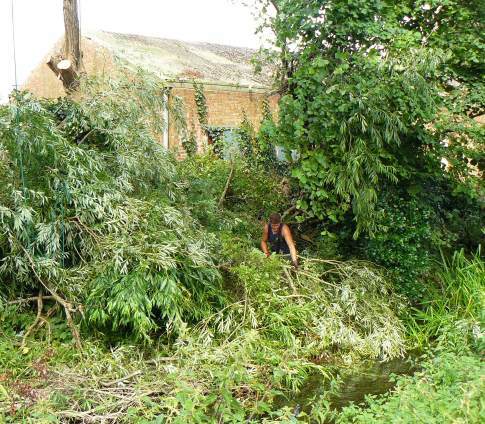 This photo shows one of the tree chaps clearing the fallen branches onto the west bank. 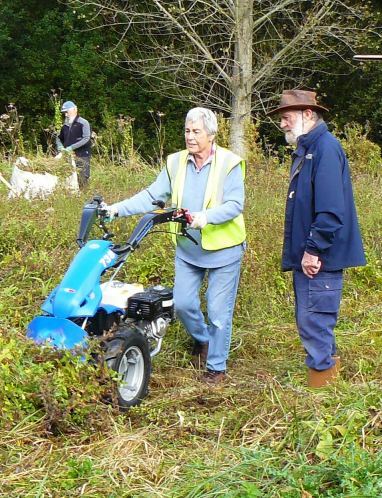 Maurice, appointed leader for the morning explained the main task, which was to remove the rough dead hedge around the wild flower area in the north meadow, so that when it was time to mow the area the risk of damage to the cutter from hidden branches, would be minimised. 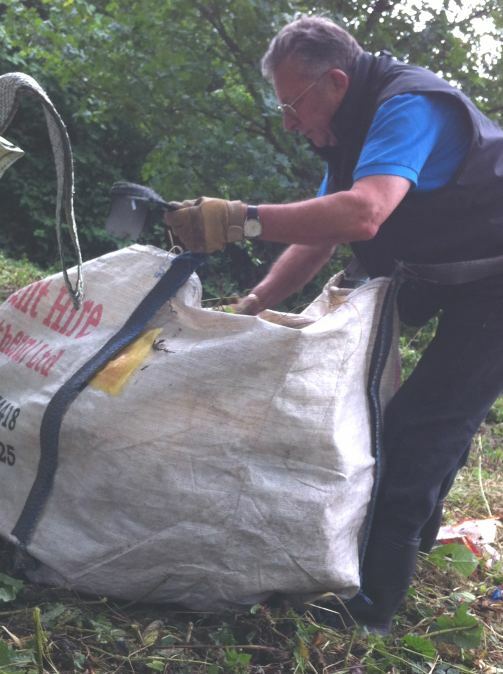 Although the task was mainly a manual operation, in the event of tools being needed, rakes, loppers or shears appropriate guidance was given to ensure safe operation. 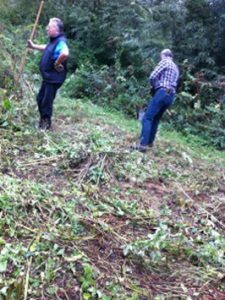 It was explained that work by hand was not without risk and care should be exercised especially when pulling grass enshrouded branches of uncertain length that others nearby could be endangered. The other tasks were to ease around the water vole information case in Palmers Road Copse and to remove a substantial branch leaning over the path near the central seat. Two trained first-aiders were present. 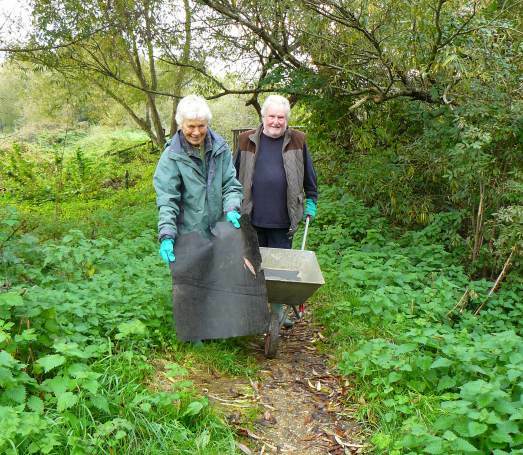 Jane and Frank litter picked the meadow, Palmers Road Copse and the surrounding paths. 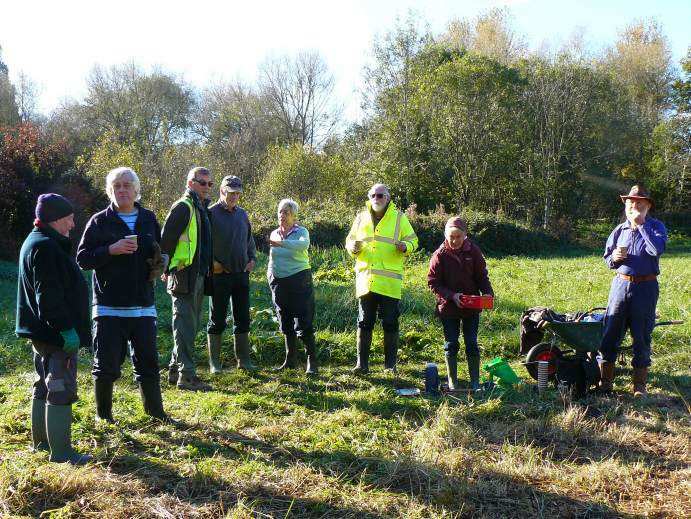 Pam, Ute, Colin, Dan and Jennifer set about the clearance of twigs and branches, including some willows that had taken root and carted it to the area in the south east corner of north meadow. 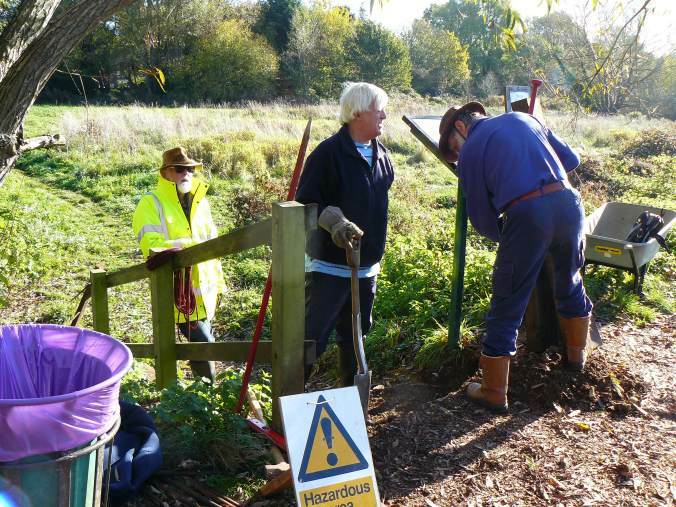 Phil modified a fence post that was preventing the cover of the water vole information board. Dave removed two branches near the central seat, one an ash that had been partly snapped off and the second the overhanging branch. As the branch was so large, Dave removed it in three sections. The last section being cut close to the ground as close inspection showed that it was badly decayed. Phil assisted Dave in this last. At 11.00 Pam served hot and cold drinks and biscuits -much appreciated by all. Colin took a group photograph for the record. 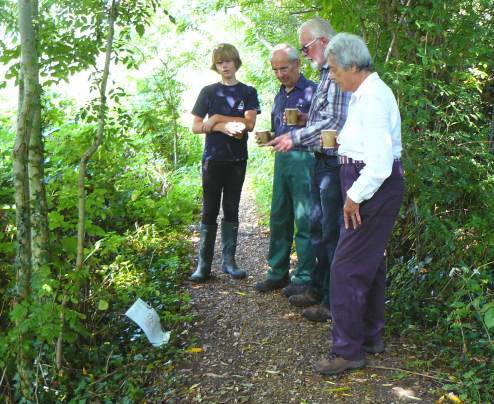 During the coffee break, John Smith and Gareth Bates of the Environment Agency, arrived at the request of BMCG to discuss the work to reinforce the foot of Gooseberry Cottage bank. This is the second phase of work started last year. 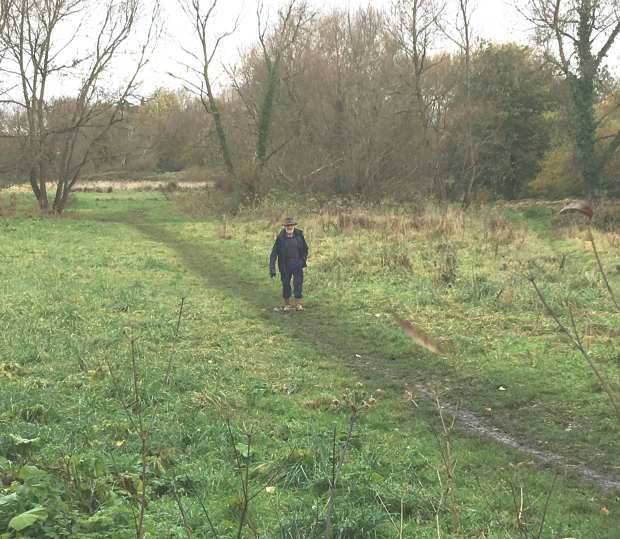 Unfortunately, the work had not been carried out to the agreed plan for phase one with the result that trees had been damaged and rare (to Brook Meadow) wild flowers had been strimmed. It is hoped that these plant, being perennials will reappear next year. Following the discussion with the EA, Maurice accompanied Messrs Smith and Bates to the site of the current works to ensure all parties that there were no other evident issues to be discussed. There were none but in the event of any departures from the current plan, Maurice would be informed, or in his absence, Jennifer. 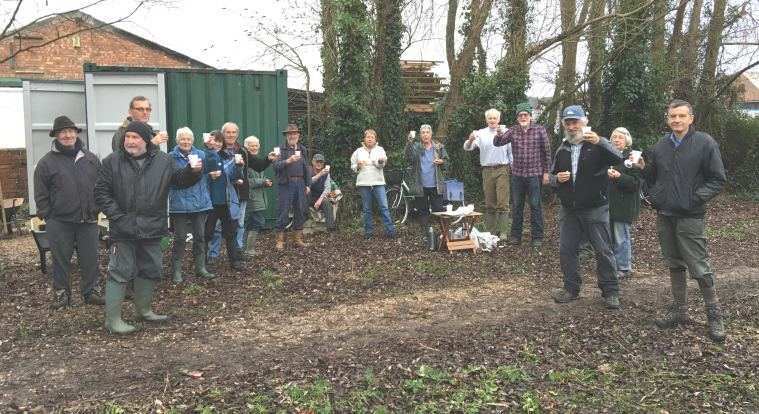 The party then moved to the south entrance to review the proposed renewal of the timber fence that runs between the public footpath and Brook Meadow. 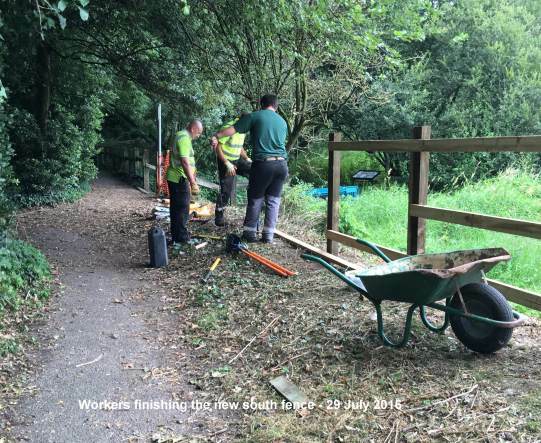 This work will include a gate which will be managed by EA in the event of flooding. At this point Brian joined the discussions and asked if there was any plan to introduce a ramp there. We were advised that there are no plans for such. Brian advised the EA that metal spikes were protruding from the ‘sand’ bag wall in the north east corner of north meadow and it was agreed that they would be ground off. At 12.00 the volunteers returned to HQ with the tools which were checked and stored. 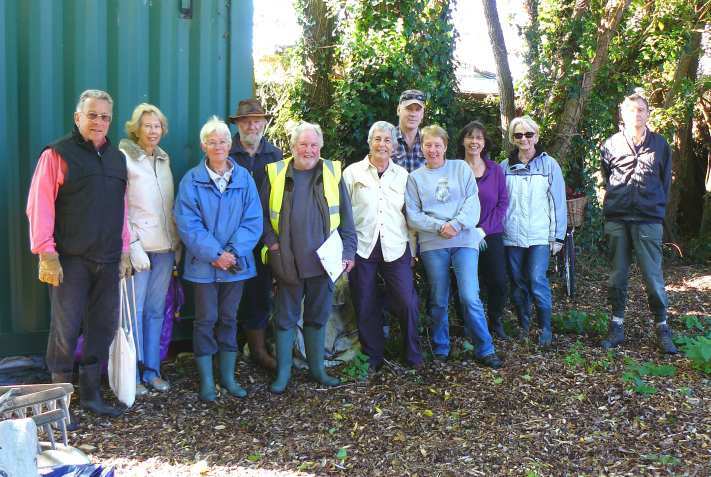 The volunteers were thanked for their hard work cheerfully carried out. The EA volunteered to cut a large dead fallen tree trunk in the South Meadow into lengths that could be handled by our volunteers. They also offered the sound sections of posts and rails from the south fence, when the new fence is to be erected. This was welcomed and it was agreed to place them securely behind HQ. 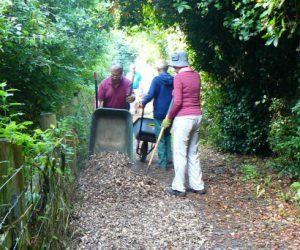 The next scheduled workday is Sunday 7 August at HQ at 09.55 to which all volunteers, both regular and anyone else, will be warmly welcomed. Tools and refreshments provided. 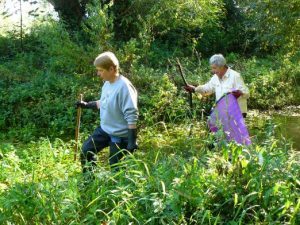 The tasks will probably include mowing main grass footpaths in all meadows, sundry tree work, the spreading of wood chippings. Future tasks will include: remaking the steps down into North Meadow from near the east end of the north bridge, widening the path outside HQ, mowing wild flower areas, mowing other areas not covered by the Contractor. 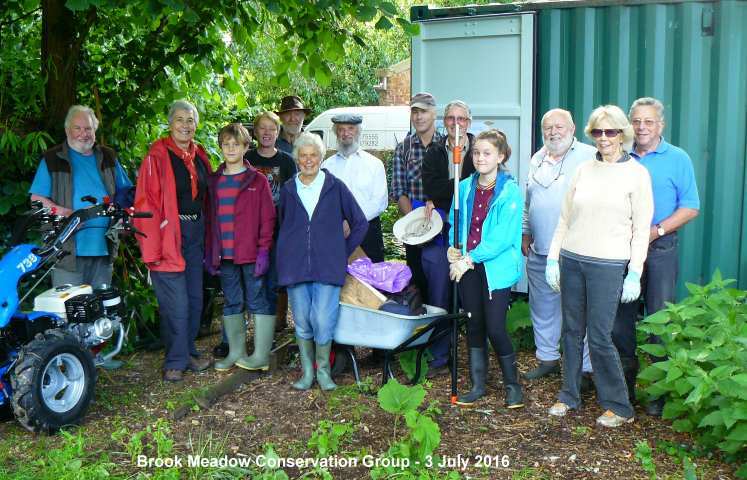 A total of 13 volunteers turned out on a humid morning to tackle a variety of tasks. 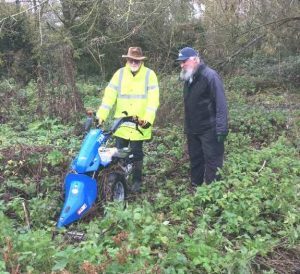 The wet weather had accelerated growth all over the meadows which required Phil to take the power scythe out to clear the paths. Jennifer and Debbie cleared around the young trees to enable a mulch of wood chips to be laid to assist the growth of the trees. Joan, Frank and Nigel headed off on a litter pick. 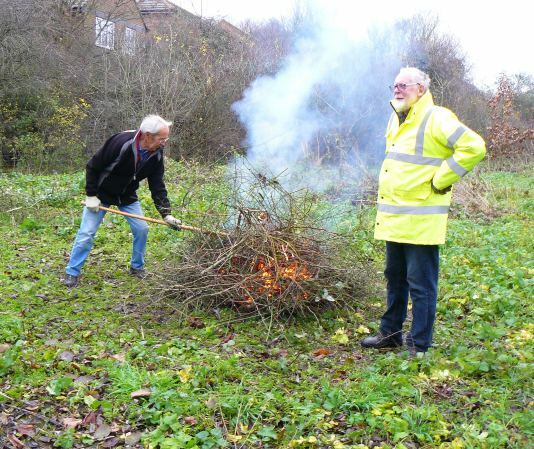 Dan, Bob and Pam cleared the debris of the Goat Willow tree from the South Gate to make the area a lot tidier. Tony set off to create room around the copse in the SW corner of the North Meadow to enable planned mowing. 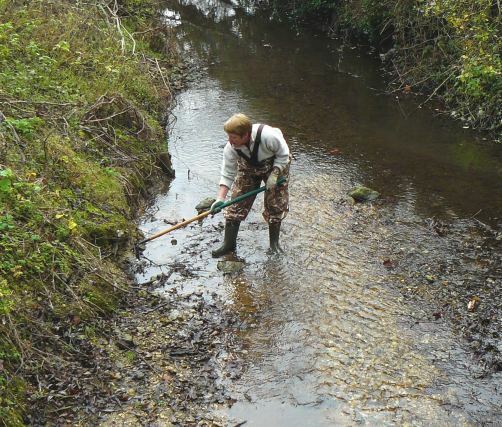 After refreshments dispensed in her usual efficient manner by Pam, Nigel took over the power scythe whilst Jennifer donned the waders and, supported by Debbie, reinforced the berms in the river by planting willow cuttings into the river bed. It is hoped that this will help create a better flow and improve the river bed. 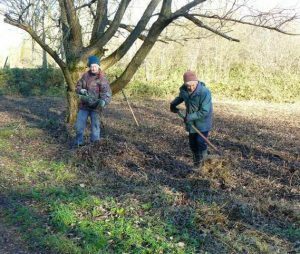 Phil, Dan and Bob joined Tony on the work in the copse and by the time it came to call it a day a clear mowing area had been created. Many thanks to all the volunteers for their hard work on what turned out to be quite a warm morning. 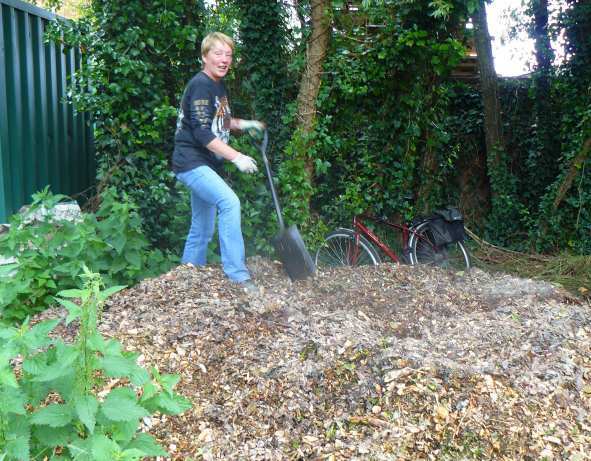 Debbie spreading the pile of wood chippings which were hot and smoking! The next scheduled workday is Thursday 21st July. Meet at HQ, located between the north bridge and The Seagull Lane gate, at 09.50, for a prompt start at 10.00. All volunteers, both regular and anyone else, will be warmly welcomed. Trained First Aiders will be on hand. Refreshments will be available. All necessary tools are provided and, where necessary training will be given.